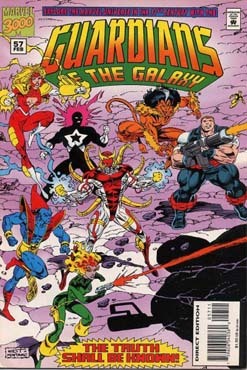 Guardians of the Galaxy 60 was cover dated May 1995 and was on sale in March 1995, sharing the spinner racks with Captain Johner & the Aliens #1, Gen-13 #1, Ripclaw #1, Superman #100, Tank Girl: the Movie #1 and X-Universe #1. 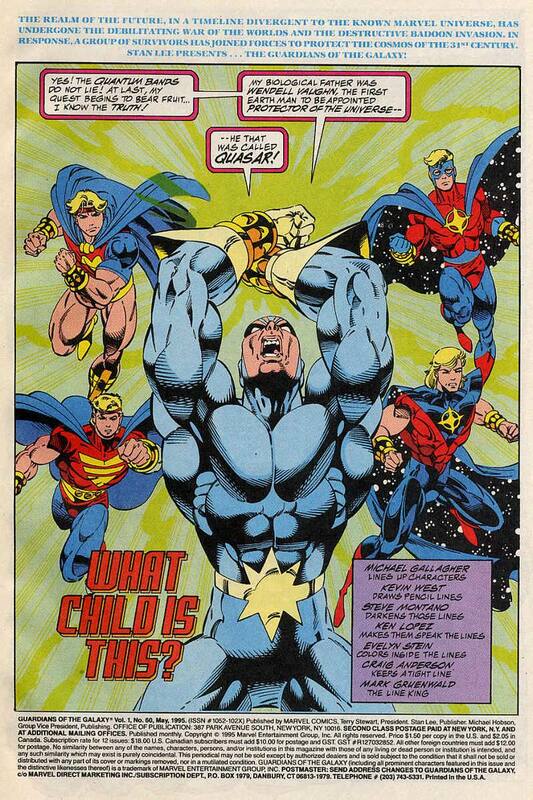 What child is this was written by Michael Gallagher, with pencils and inks by Kevin West and Steve Montano and opens with the Quantum Bands confirming Eon’s proclamation that Starhawk is the son of Quasar. He uses the Bands to find his fathers grave and prepares to leave, but Eon points out that he was only supposed to borrow the Bands, he does have to give them back. 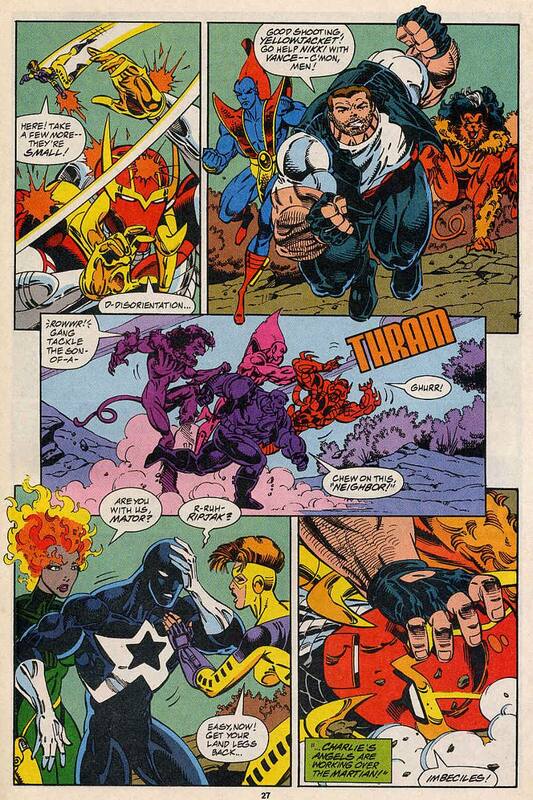 Starhawk refuses and is confronted by the Keeper, who wants the Bands back. 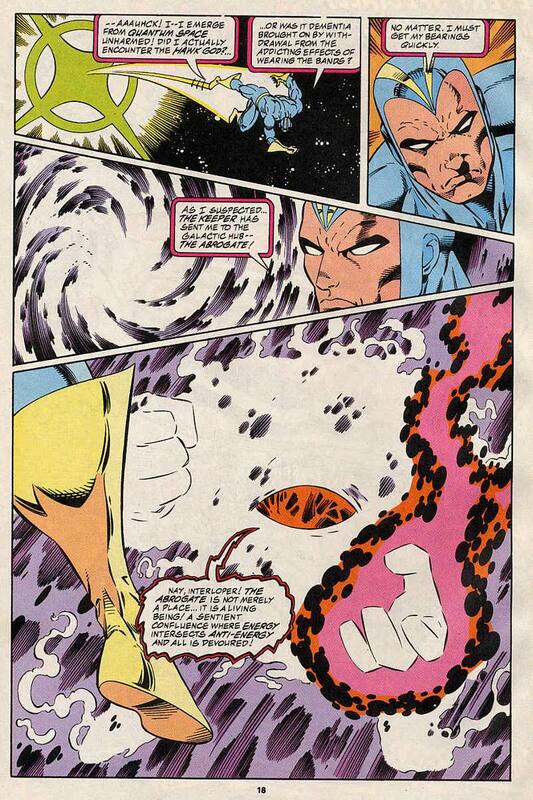 There is a fierce battle between the two before the Keeper manages to pull the Quantum Bands back to him, sending Starhawk through hyperspace to the Abrogate, the creature that killed Quasar. 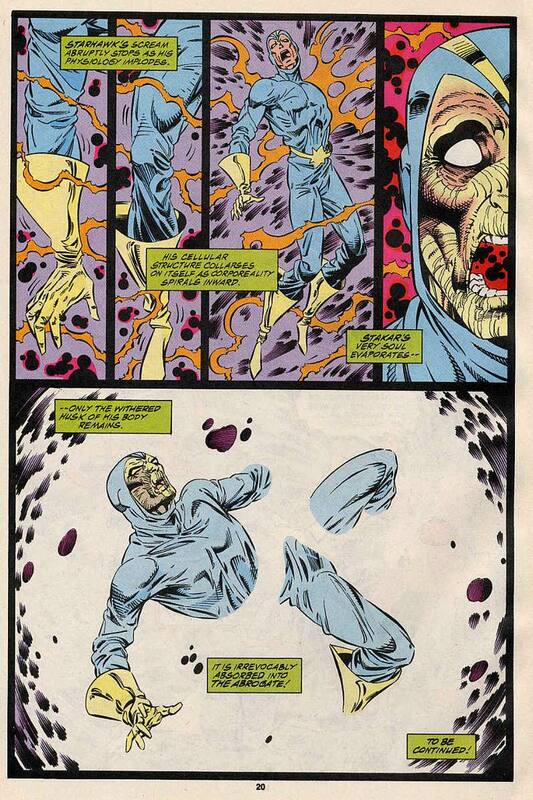 On his way there he encounters the Arcturian Hawkgod who takes great pleasure in torturing him before he appears before the Abrogate, who proceeds to drain the life from him and pull him in to the void within. Notes: A quick little story, furthering the search for Starhawk’s parents, very much a middle chapter. The Keeper makes short work of Starhawk who behaves even more out of character this issue, mostly due to the Quantum Bands. 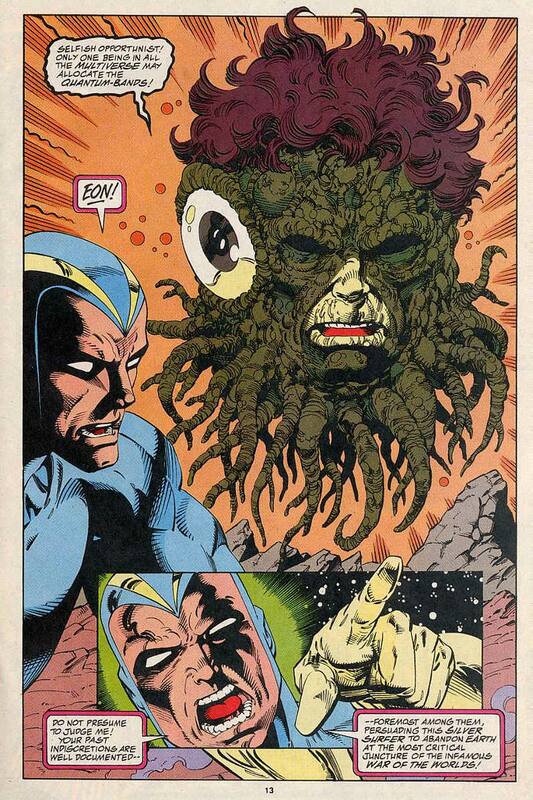 Eon seems a little more sinister than when he was in the Quasar title. 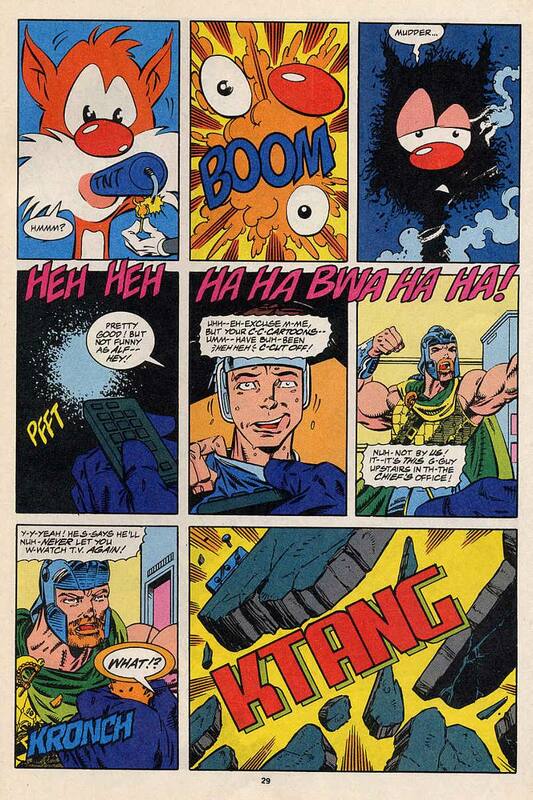 It’s unclear whether the Hawkgod is there, or whether Starhawk is hallucinating. 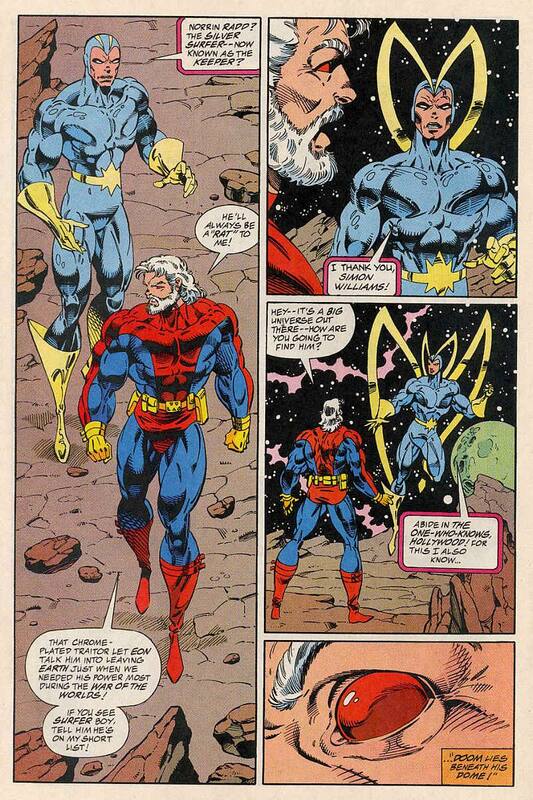 Wherever Quasar went, Starhawk is there now, following in his father’s footsteps. Back Up Feature: Homeward Bound starring Yellowjacket. 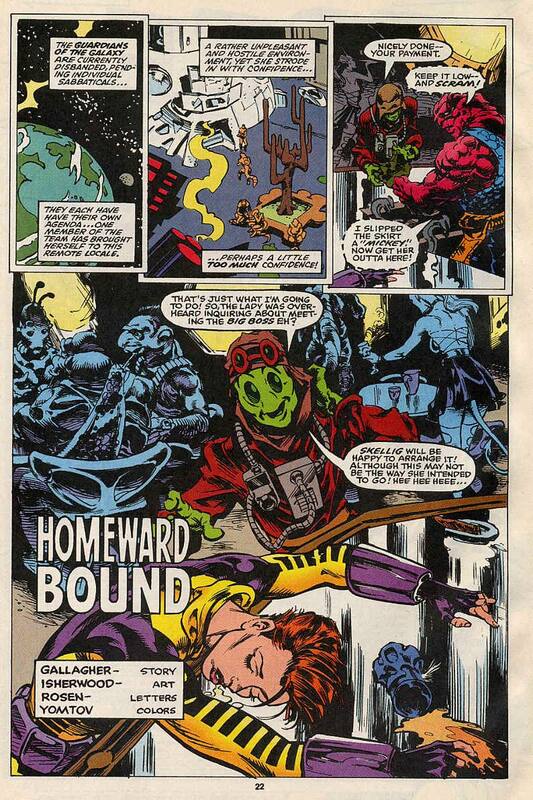 Homeward bound was written and drawn by Gallagher and Isherwood and opens with a drunk Yellowjacket passed out on a bar on some remote planet. 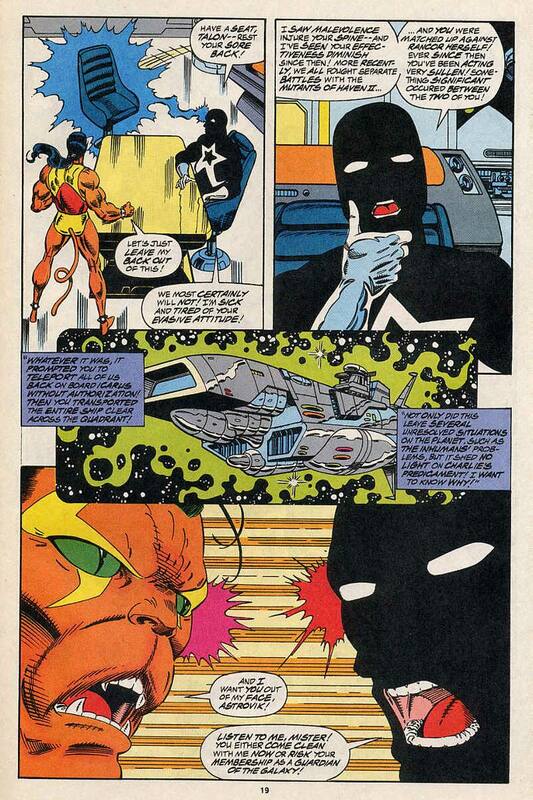 She is captured and brought before Slagg, whom we last saw being beaten up by Hollywood, seems he holds a grudge and wants to take it out on the nearest person in a g-star. 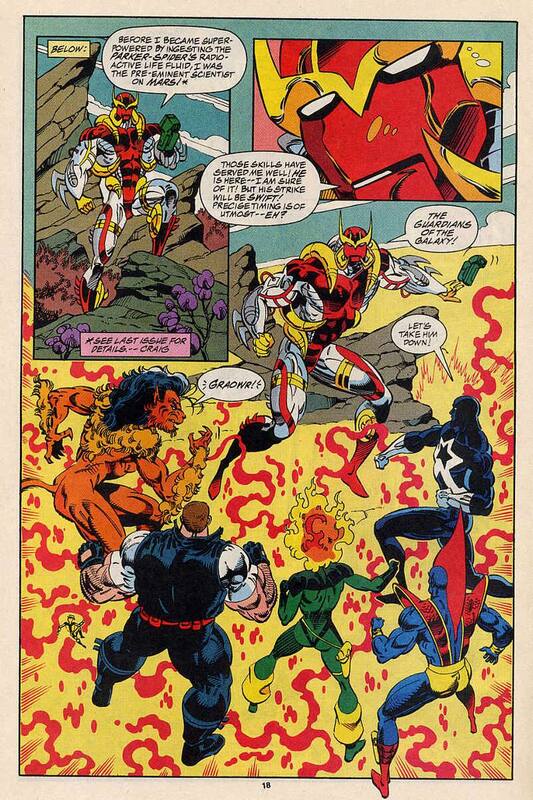 He straps Yellowjacket to a chair and removes her Pym Particle launchers expecting this to leave her helpless. 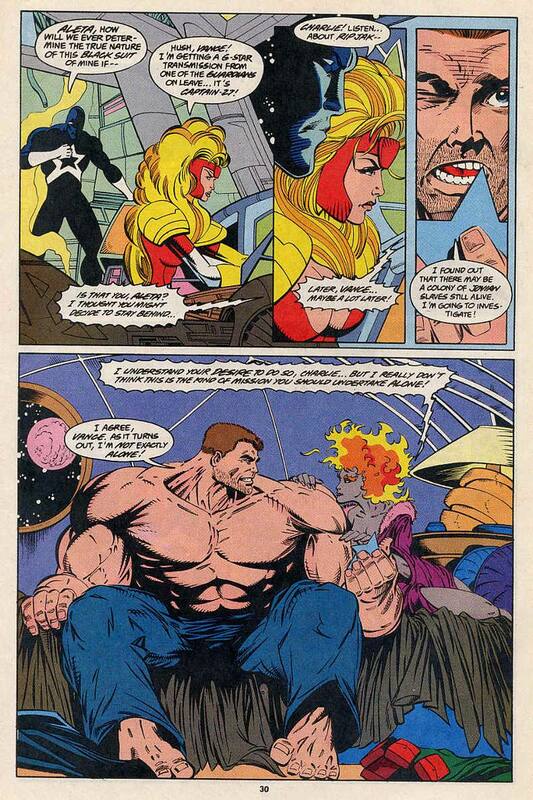 She has a spare growth pill from her time working with Dr Hank Pym and grows to enormous size and also beats Slagg up. She beats him to a pulp and promises to shrink him to gnat’s size if he doesn’t do him a favour. She wants him to send her to someone who can send her back in time. 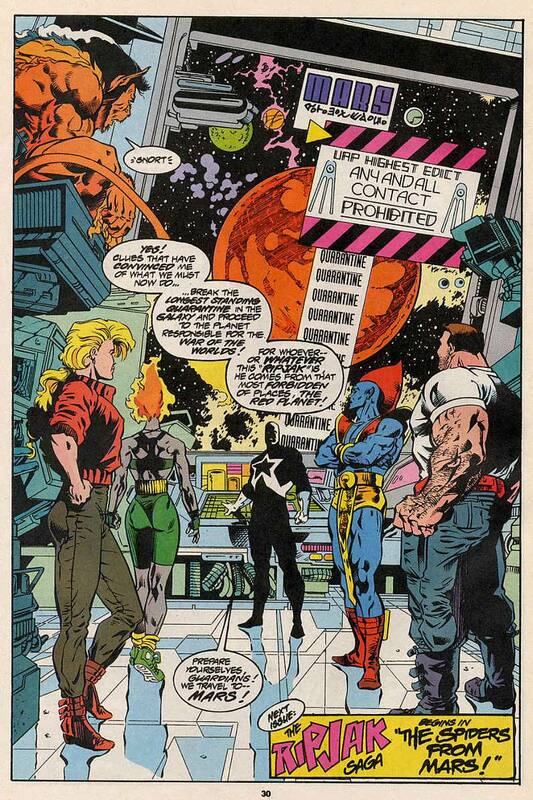 Using this group of time travel specialists, Yellowjacket returns to the 1990’s of the Guardians of the Galaxy’s timeline, so she can be with Hank Pym during the War of the Worlds. 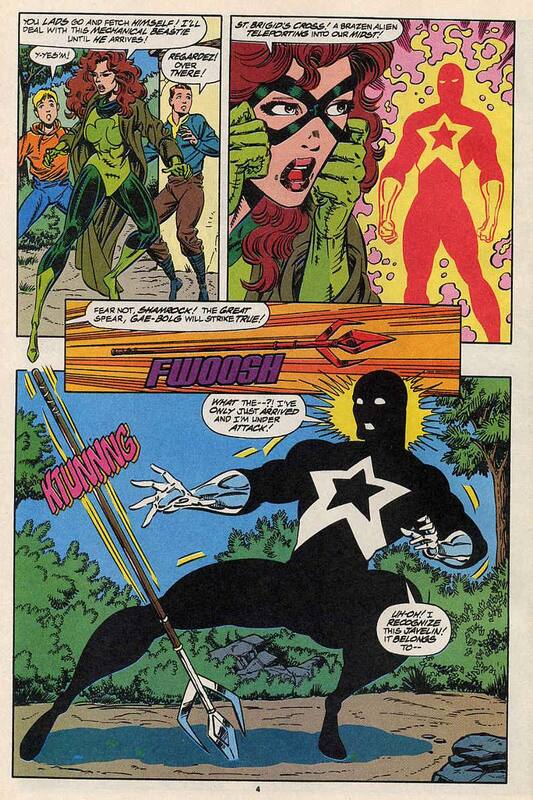 Notes: It was nice to give Yellowjacket a bit of spotlight time, and her facing off against Slagg was one of her better moments. The fear of heart problems when you grow is getting a bit over done now, but does answer the why not go giant every time question. In the end she goes back to her own time, if not her own timeline, which raises a question, was Michael Gallagher done with her? Or did he not get to do the things he was trying to do? 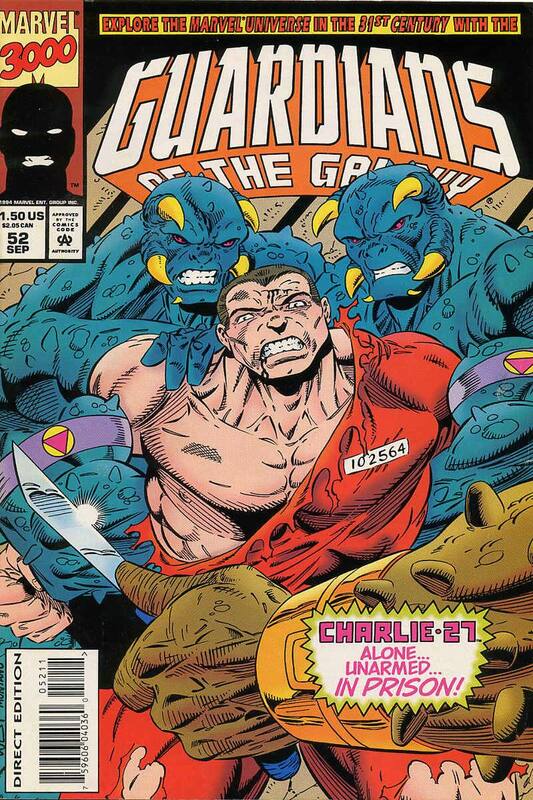 Over-all a bit of a lack lustre issue, the title is coming to the end at it’s sad that it’s not more upsetting. Guardians of the Galaxy 59 was cover dated April 1994 and was on sale February 1994, sharing the spinner racks with Amazing Spider-Man #400, Flash #100, Impulse #1, Preacher #1, Visitor #1 and Web of Spider-Man #123. 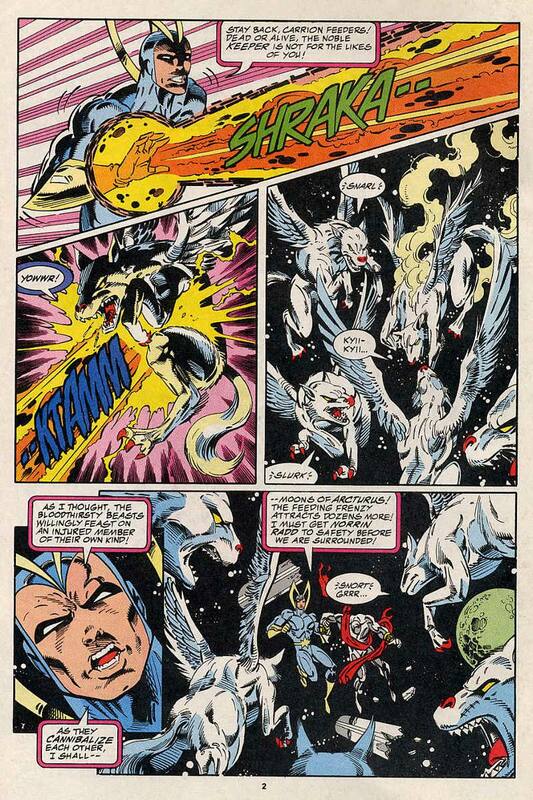 Orphan in the storm was written by Michael Gallagher, with art by Kevin West and Steve Montano and opens with Starhawk finding the Keeper near death and about to be eaten alive by a pack of Saturnian Hound-hawks. Starhawk zaps one of them to distract the pact, only to attract a larger group in a feeding frenzy, some feed on the wounded Hawk-hound and the rest chase Starhawk, who flies off, shortly followed by the Keeper’s reformed surfboard. 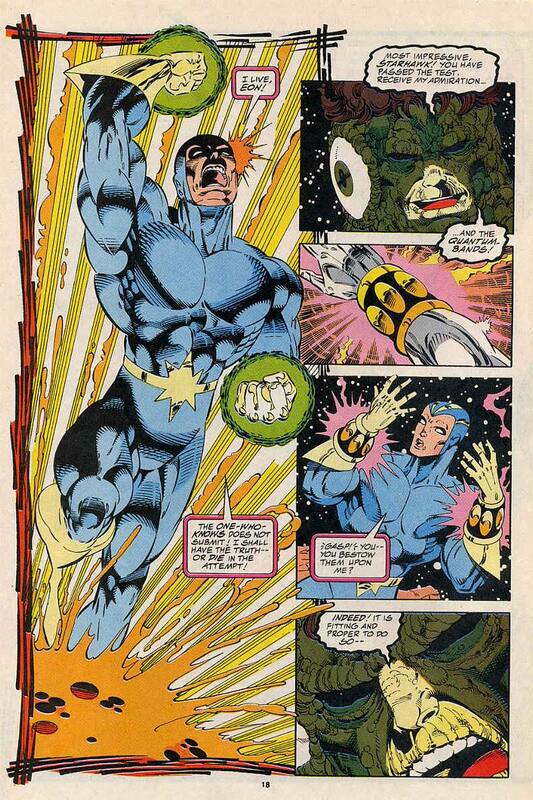 Starhawk flies off at lightspeed and lands with the Keeper on a nearby uninhabited planetoid, then uses his light to heal him. 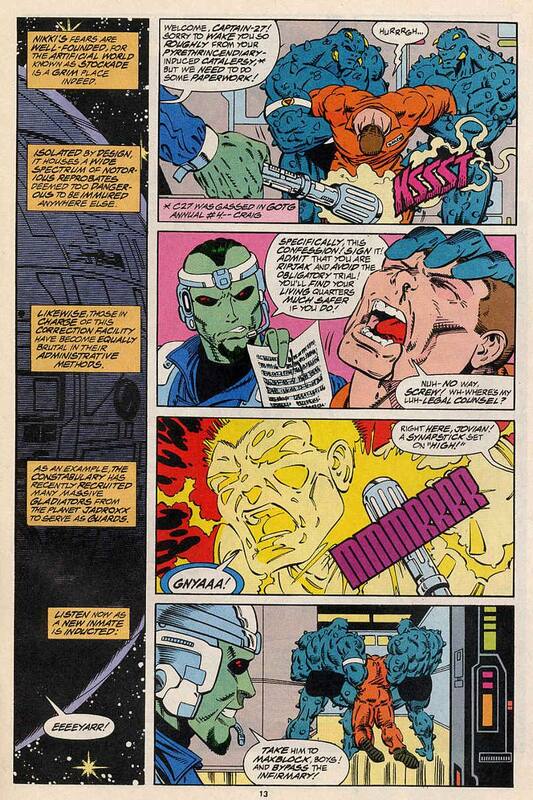 The Keeper awakens and tells Starhawk of the events that occurred since Guardians of the Galaxy #25. 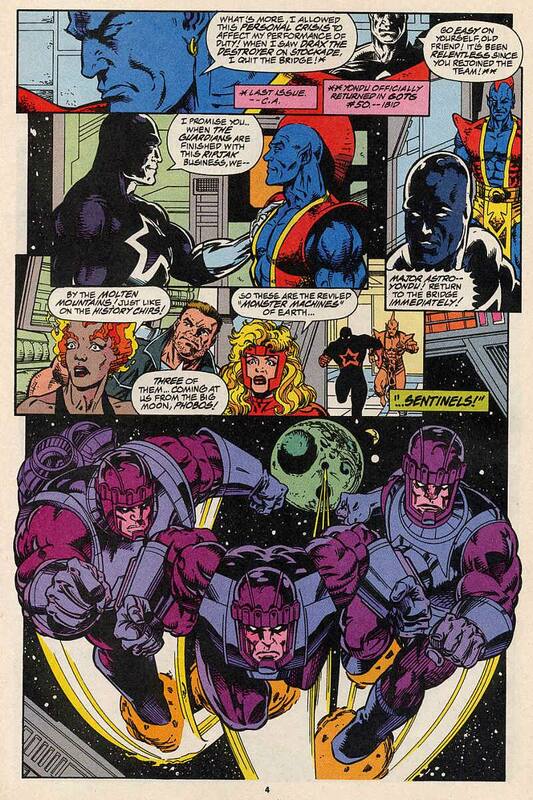 Basically Galactus got sick of eating the planets without people and wanted to eat planets with people, when the Keeper (probably having had this conversation several times already) was a bit snotty in reply and Galactus just attacked him, viscously wounding him and leaving him where Starhawk found him. 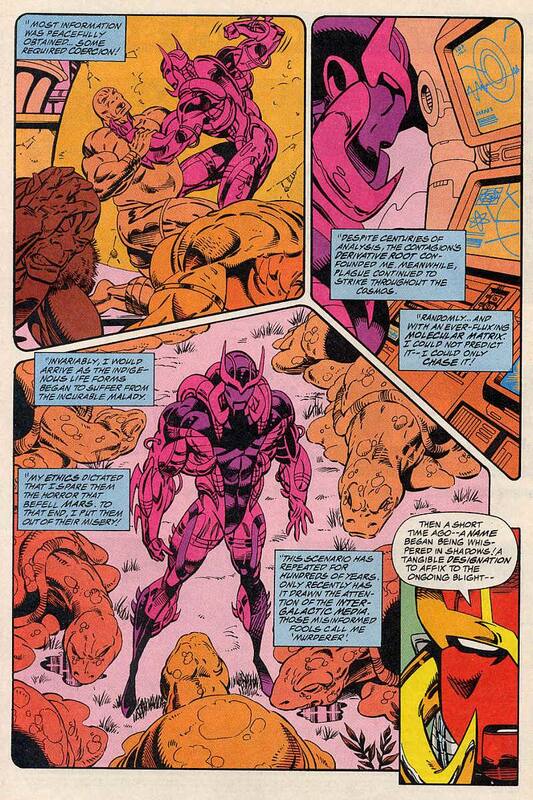 Starhawk tells him to rest and heal and then help Starhawk with his problem and then go after a rogue Galactus, before looking at the Quantum Bands on the Keeper’s wrists and wondering if maybe he could use them himself. 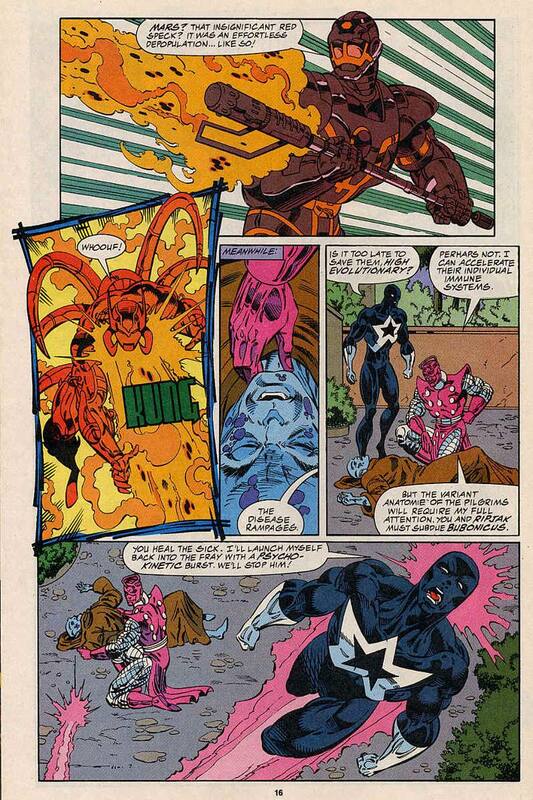 As soon as he touches them, the cosmic entity Eon appears and admonishes Starhawk for his greed. 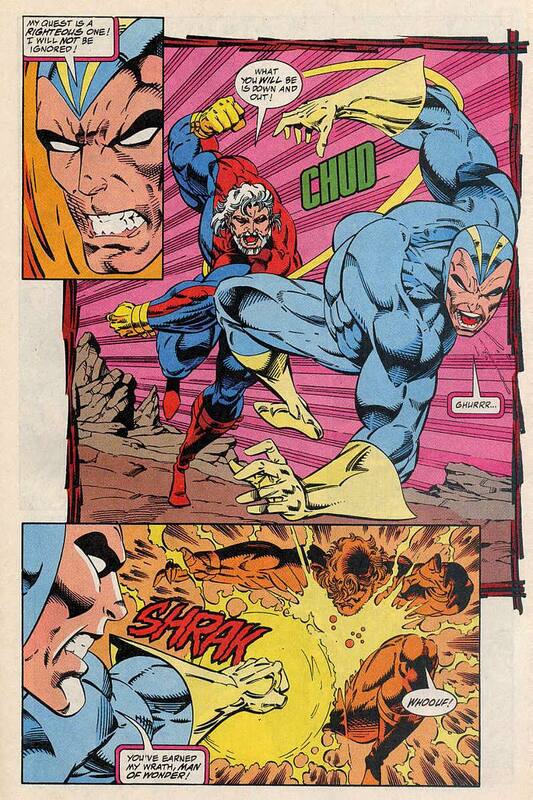 He reduces him in age, until Starhawk reverses this. 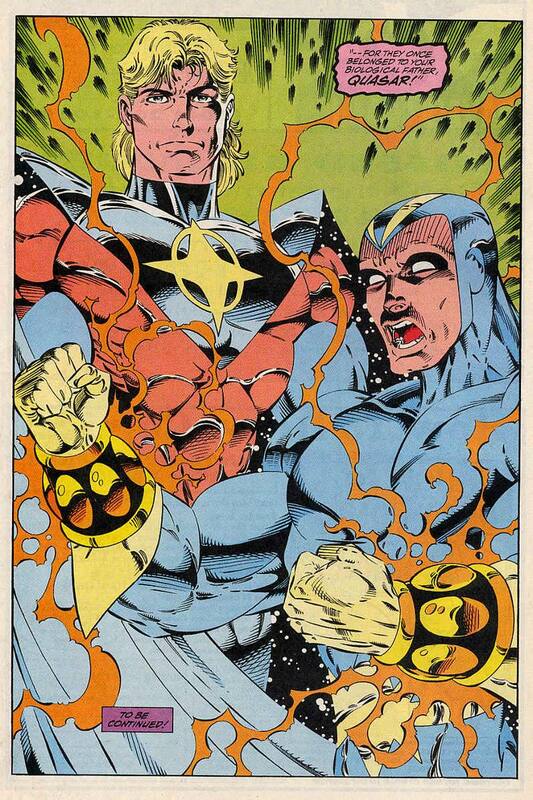 Supposedly impressed by Starhawk’s resolve, Eon grantes custody of the Quantum Bands to Starhawk, which is fitting, since they also belonged to Wendell Vaughn (Quasar of Earth) who just happens to be Starhawk’s true father. None of this story makes any sense. 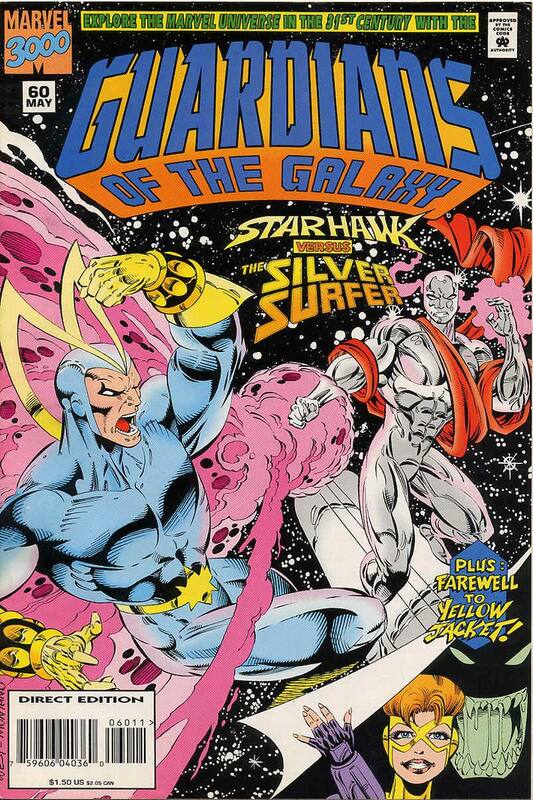 The Keeper is lying somewhere in space and I will concede that Starhawk will be able to find the Keeper, but the Hawk-Hounds (Last seen in #26) just happening to be there in some random solar system? 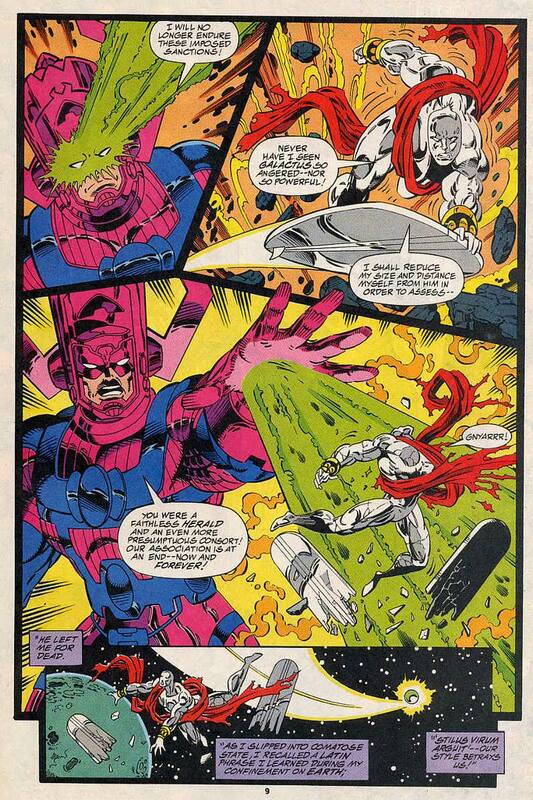 Both the Keeper and Galactus seem quite out of character, arguing like a married couple or a parent and teenager before getting into a fight, I found this a little difficult to go along with. 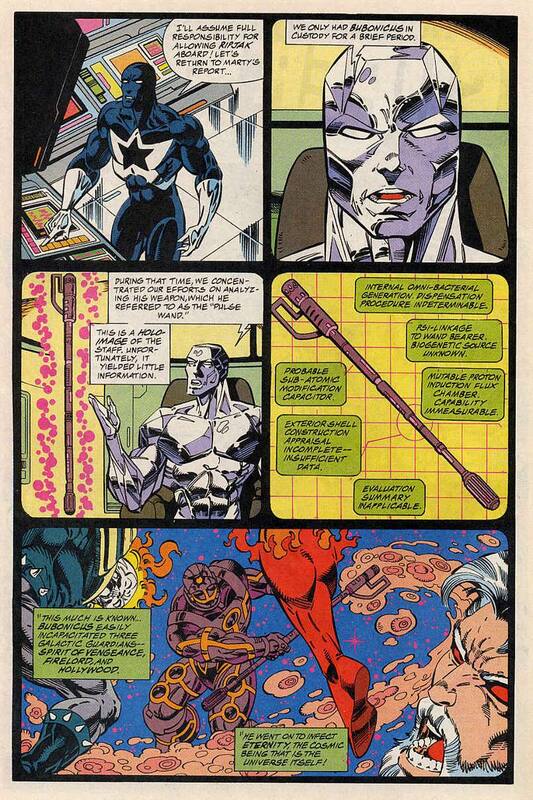 The Keeper being able to help Starhawk research his past is a stretch, the Quantum Bands being able to help him falls under the grasping at straws catergory. 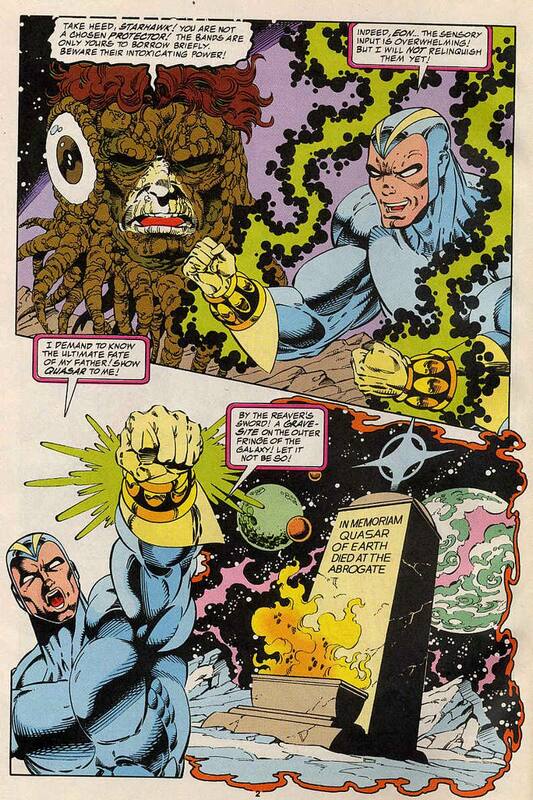 Starhawk seems unaware that the Quantum Bands cannot be forcibly removed from their wielder, so he would have to cut the Keeper’s hands off just to get at them. 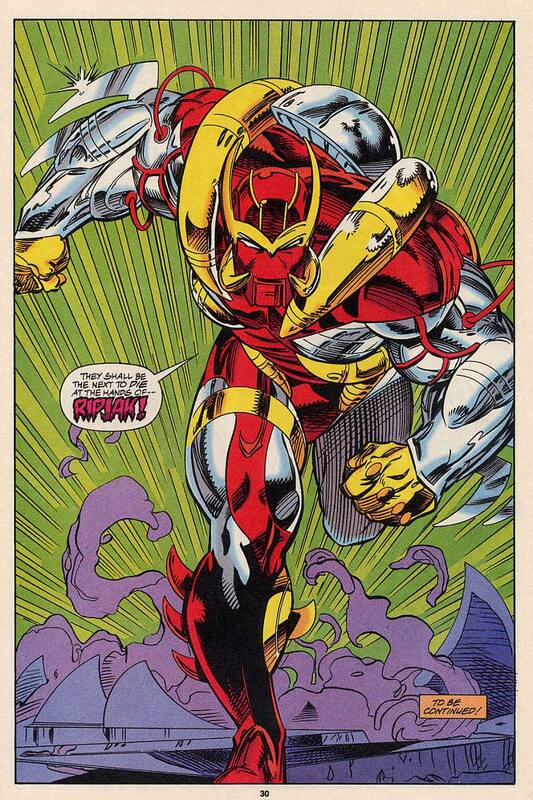 The fact that Quasar is Starhawk’s father does remind us that Starhawk is over a thousand years old and could have ties to the modern era of heroes. 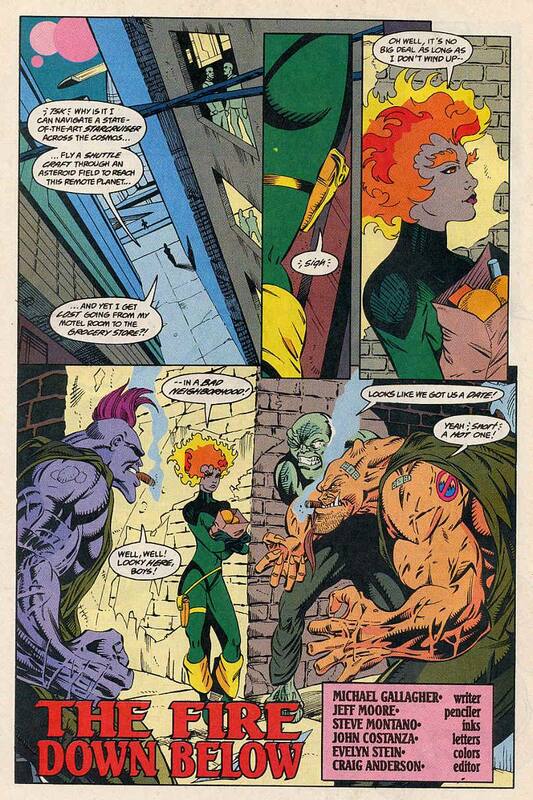 The Fire Down Below was written by Michael Gallagher and pencilled by Jeff Moore with Steve Montano on inks and shows us Nikki on her sabbatical from the Icarus on a remote planet. She is cornered by three alien creatures who are like the song goes, up to no good. 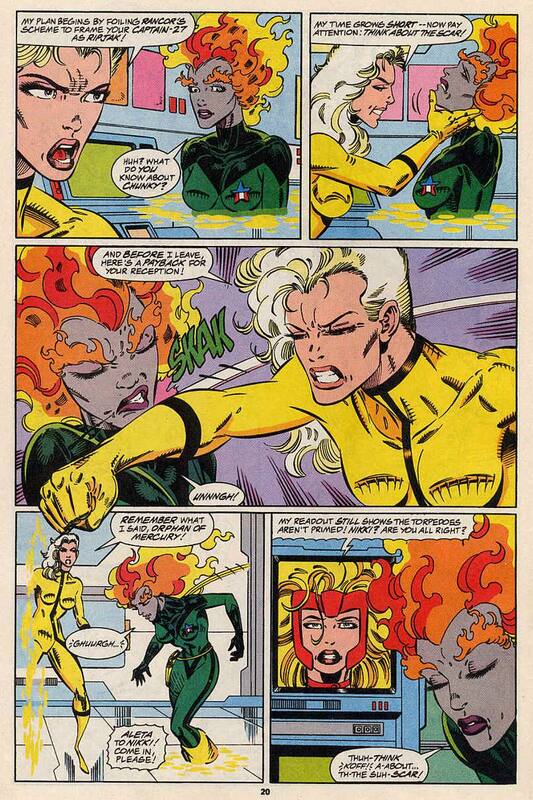 They grab her and she fights back using her hair to burn them. Doesn’t really go well since they’re lava miners and so she tries to blind them with a solar flash. While their eyes recover, a new player enters, Captain Charlie-27. Charlie wastes no time in expressing himself, the aliens recognises him as a Jovian before trying to escape. One of them finds himself face to face with Nikki’s pistol when he tries and she asks him how so far from our solar system, 12 years after the species was known to be wiped out, how he can recognise a jovian at all. It turns out that there may be an enslaved colony of Jovians and Charlie-27 wants to check it out, he tells Vance who tells him that he shouldn’t do it alone, but as we see in his bedroom, he isn’t. Their G-stars are left outside the room, so another adventure can begin. This was a nice little story with Nikki and Charlie-27 getting a bit of spotlight. Charlie’s one liners and he general bad-assery is very entertaining. I don’t know how much of this Jovian mystery is resolved if any of it, but this story does serve to put Nikki and Charlie back together. If nothing else, these two deserve a happy ending. 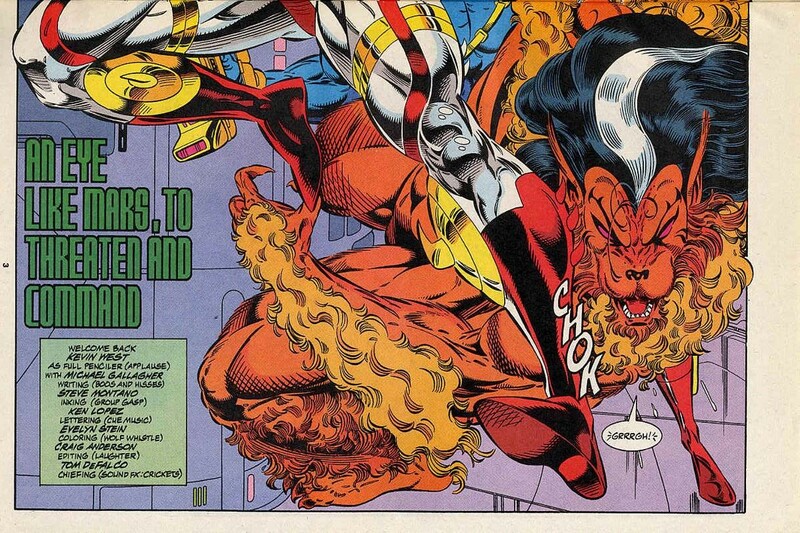 NEXT TIME: More searching for answers by Starhawk and Yellowjacket too. 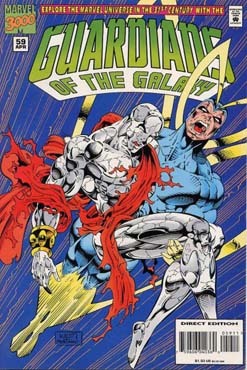 Guardians of the Galaxy 58 was cover dated March 1995 and was on sale January 1995, sharing the spinner racks with Absolute Vertigo #1,Lobo/ Deadman: Brave and Bold #1, Power of Shazam #1, Superman: Kal #1, Astonishing X-Men #1, Factor-X #1 and X-Man #1. 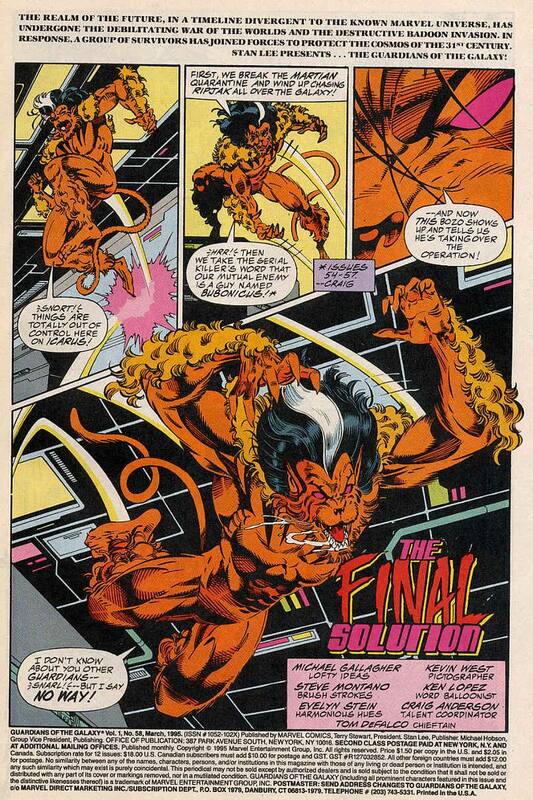 The Final Solution was written by Michael Gallagher, pencilled by Kevin West and inked by Steve Montano and opens with Talon recapping the recent events in a very clunky manner before jumping at the High Evolutionary. This doesn’t do too well and it’s leads to the rest of the team attacking, until the intervention of a giant sized Yellowjacket. 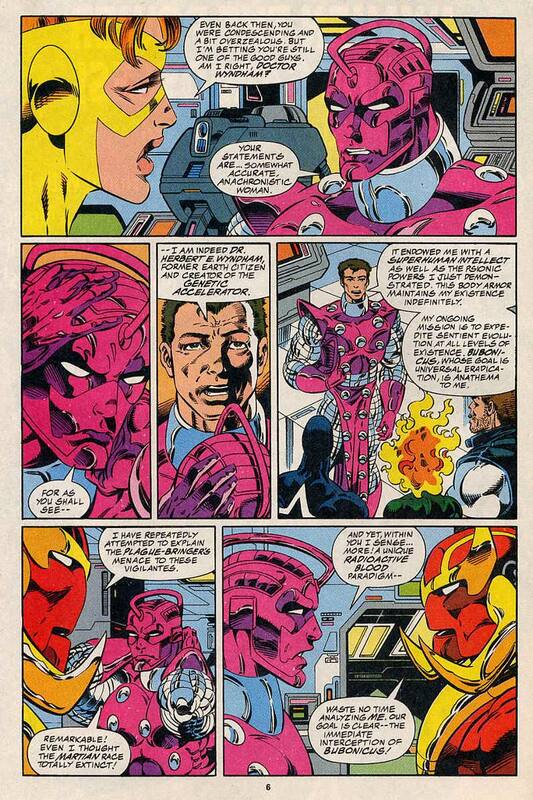 Yellowjacket points out that the High Evolutionary was once a human being and petitions for reason. 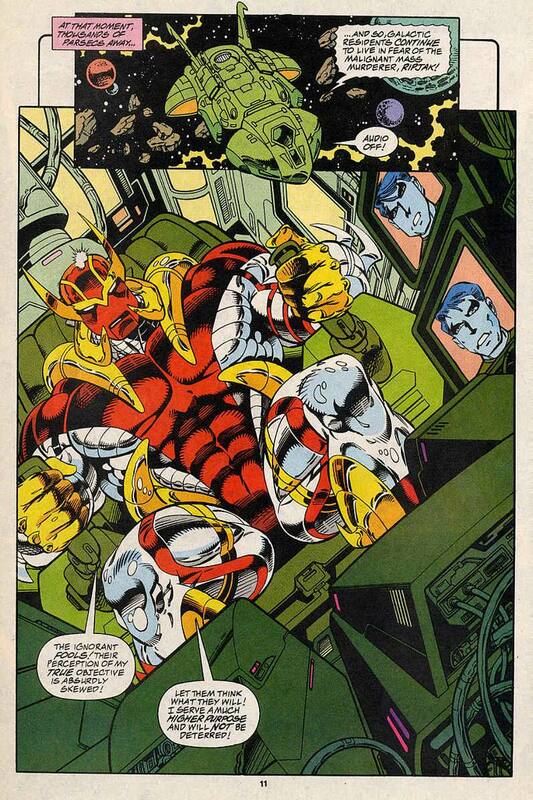 High Evolutionary, Ripjak and Vance Astro talk about finding and stopping Bubonicus and the three of them tele-port over to Ripjak’s ship (currently held in a tractor beam) to pool resources. After some technobabble, the next destination of Bubonicus is the pilgrim planet Sanctuary. 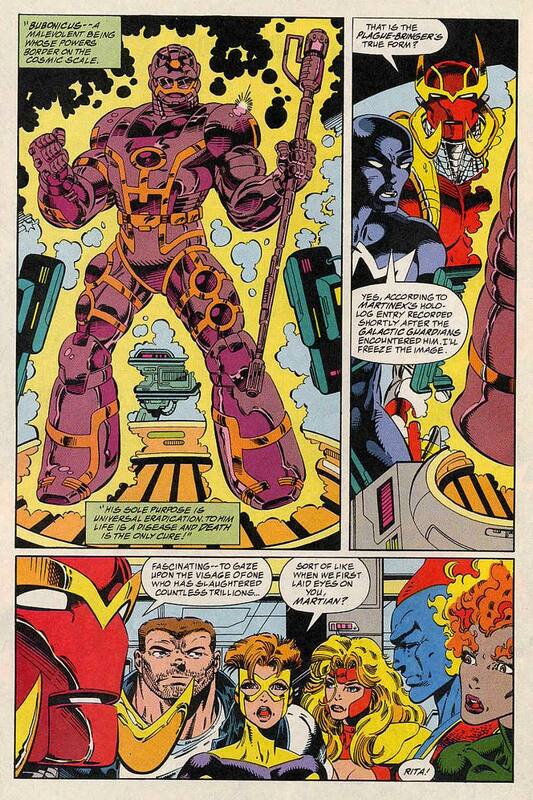 With the risk to the other Guardians, Vance agrees to accompany the other two alone. To say the team takes this badly is an understatement. 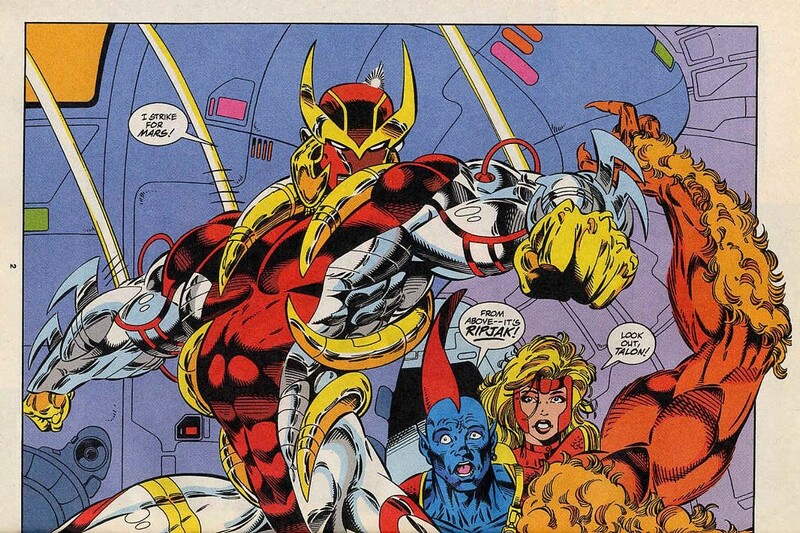 Charlie-27, Yellowjacket and Talon all voice their objections and as Vance leaves, Talon uses this chance to sow more discontent amongst the team over Vance’s leadership. 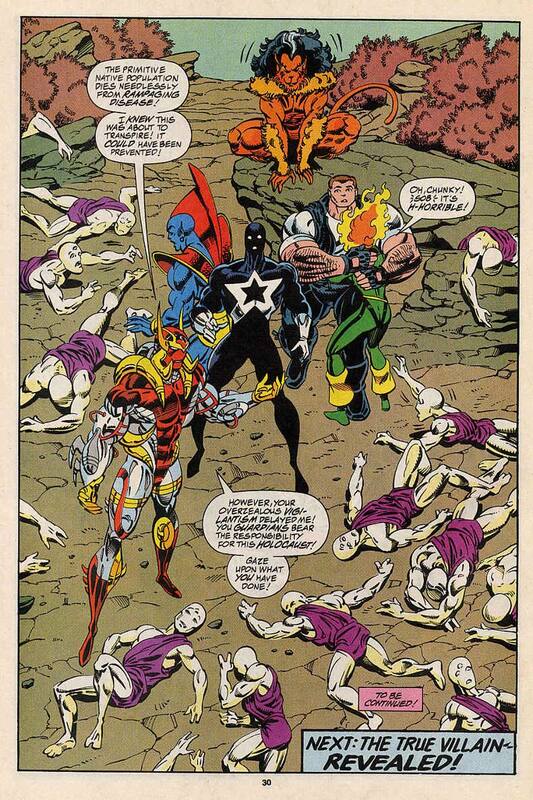 On Sanctuary, Vance and Rijak engage Bubonicus, whilst the High Evolutionary attends to diseased pilgrims. 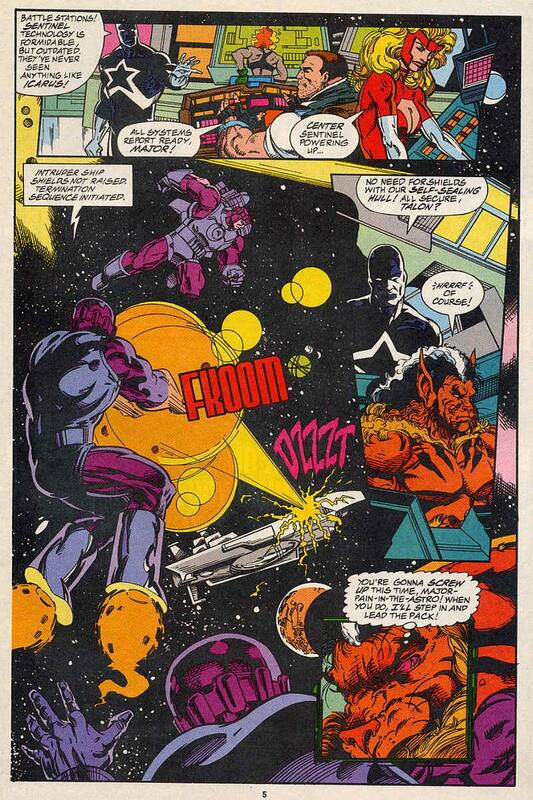 Vance is knocked out and when he awakens, he learns that Bubonicus has gone and that Ripjak has followed him and the High Evolutionary is about to follow, but Vance is to be left behind. 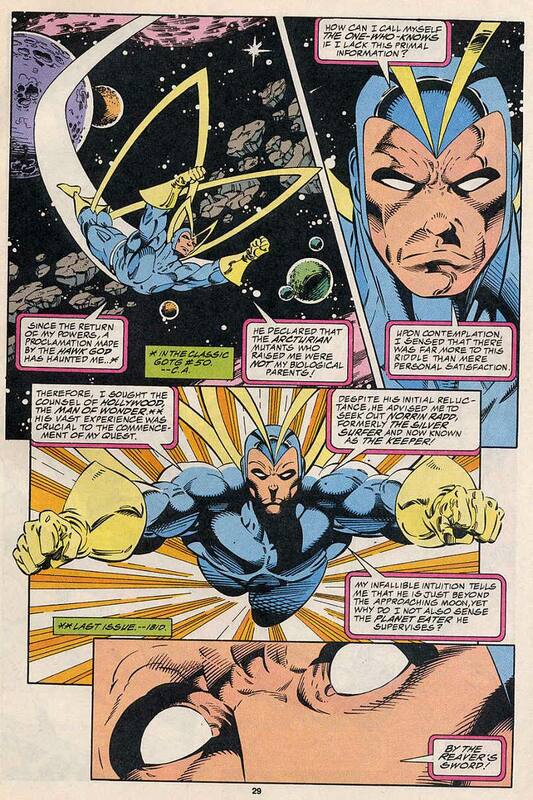 Dejected, Vance contacts Icarus, but there’s no one there. Once back on the Icarus, Vace learns that the team has been temporarily disbanded, before an election can be called for a new leader upon the team members’ return. Everyone except Yondu agreed to this, but he also left. The only person left on board with Vance is Aleta who wants to renew her relationship with Vance, reminding him that they are still engaged. 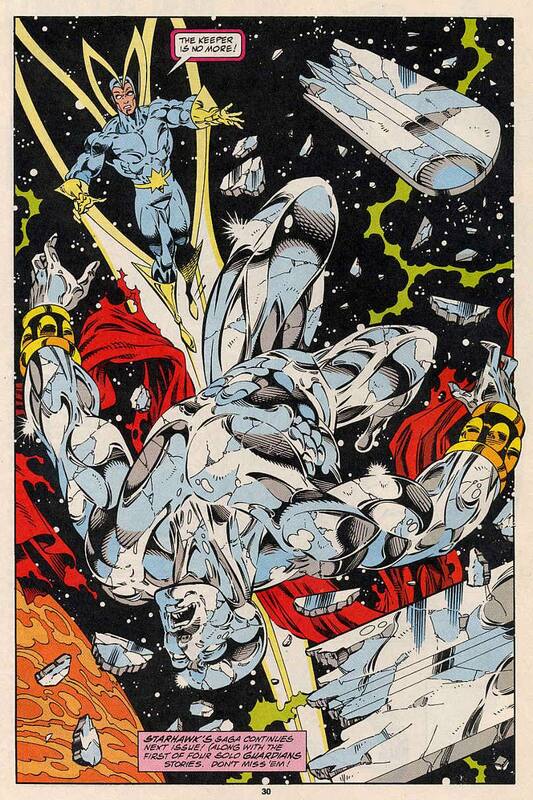 As the two reunite, Starhawk flies past on his search for the former Silver Surfer, Norrin Radd, whom he finds floating in space, beaten and left for dead. 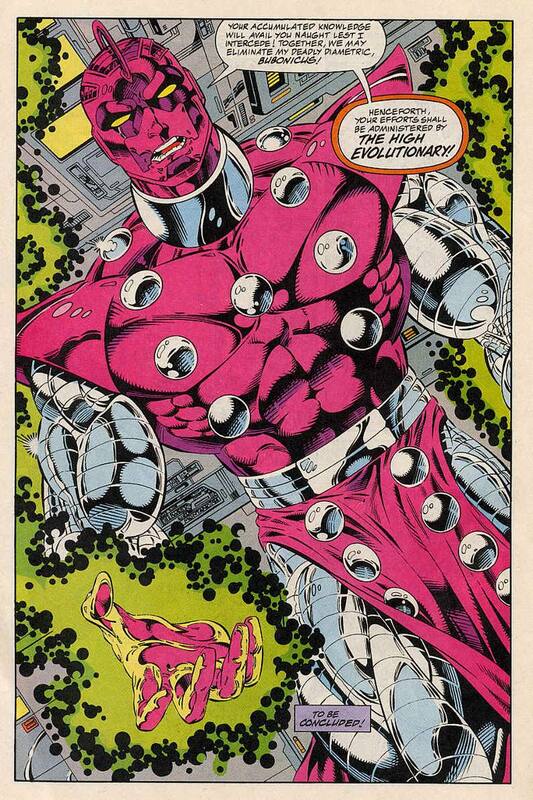 Now for some reasons we have the High Evolutionary? Talon’s recap before his attack is just plain awkward. 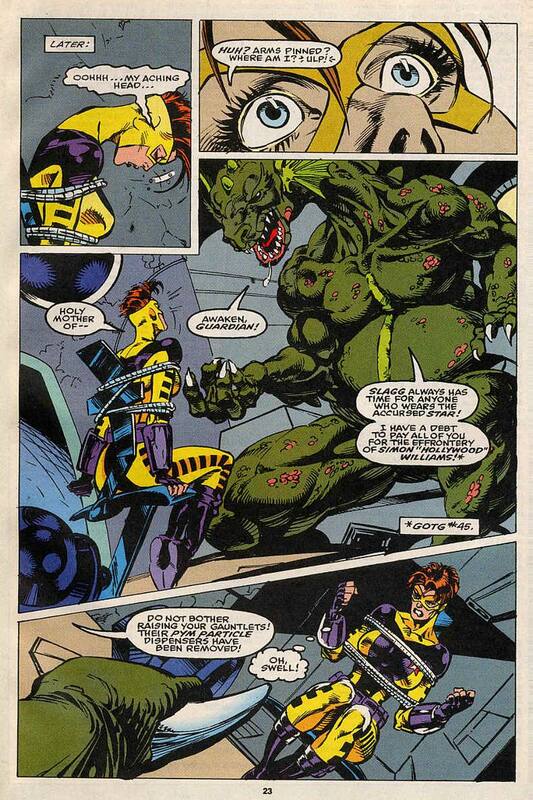 Yellowjacket growing to giant size to prevent the fight, despite the very real risk of heart failure is a reminder of how criminally under-used she has been in this series. 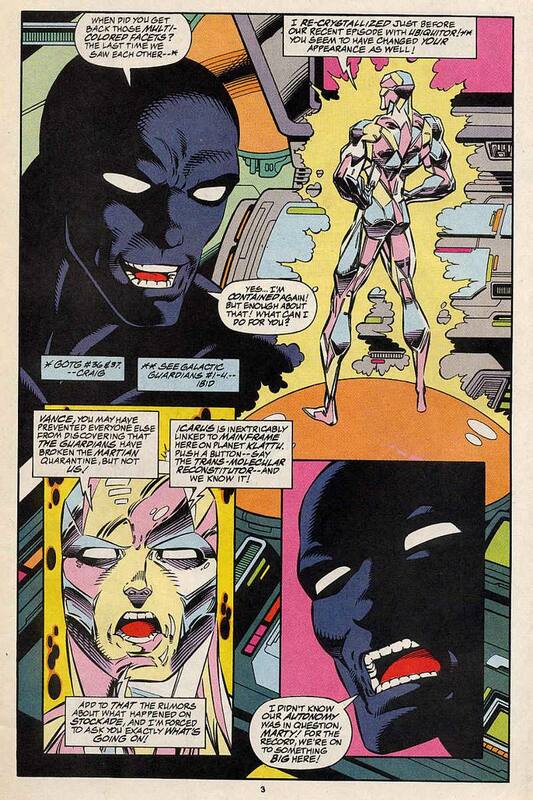 The High Evolutionary invites Vance along because of his black body suit, then he’s considered a liability for the EXACT SAME REASON….Wtf? It was nice seeing Vance in action. 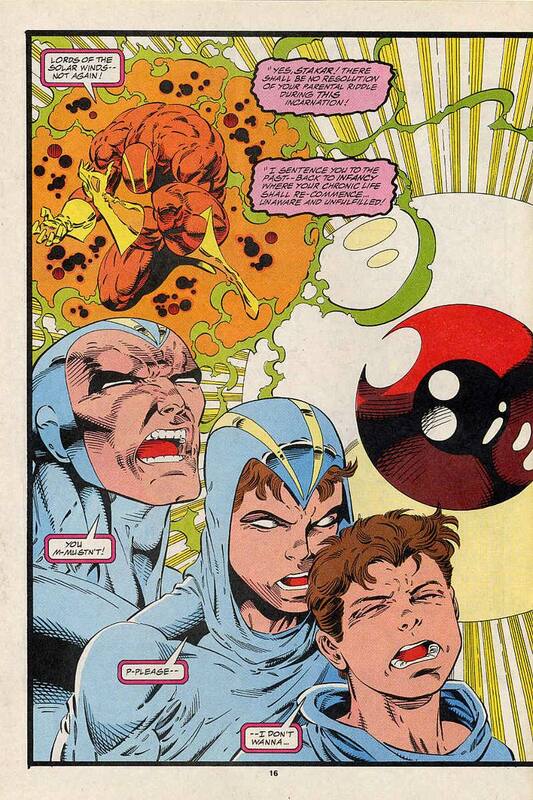 This issue brings to an end the period of Vance being the leader, which started in #17. This is also the end of the saga of Ripjak/Bubonicus and this starts the last phase of the series. NEXT TIME: Starhawk’s quest and a back up feature. 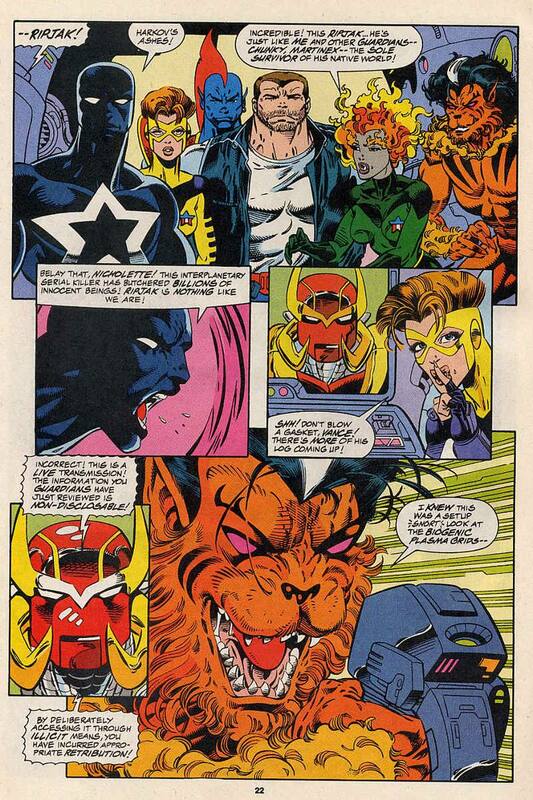 Evils draw men together was written by Michael Gallagher, pencilled by Kevin West and inked by Steve Montano and opens with Ripjak trying to blame the Guardians for the carnage seen in the last page of the last issue. 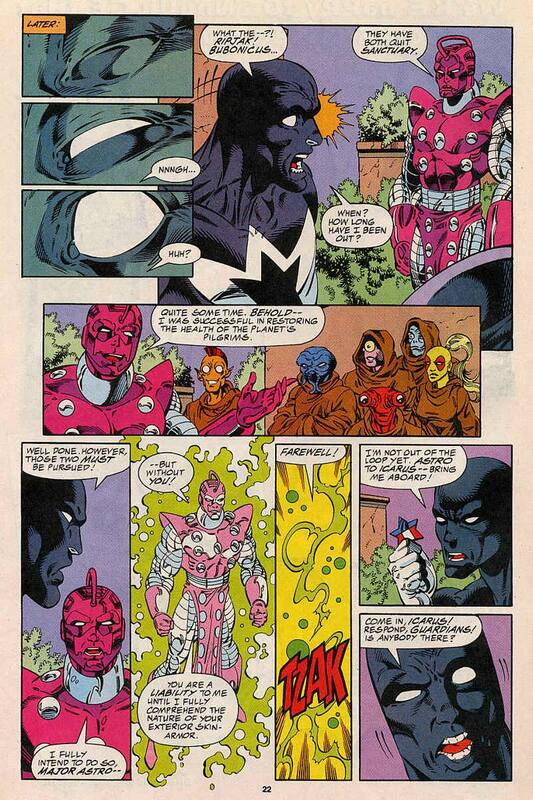 The Guardians don’t want to listen and there is a brief battle before Yondu tries to make peace. Because of his empathic spiritual powers (I’m sorry What?) he can sense the truth in Ripjak’s words, but he wants to know what happened after all the martians died. After years of research, Ripjak determined that the plague was synthetic and searched the galaxy to try and find more instances of this plague. More and more worlds had fallen to this malady and the ethics of Mars dictated that they shouldn’t be allowed to suffer like this, when there was no hope of a cure. This is why he has been destroying whole worlds, to spare them the pain of their final days. This isn’t serial murder as much as it is euthanasia. He points out that there has been a name attached to this recently and Vance interjects with Bubonicus. 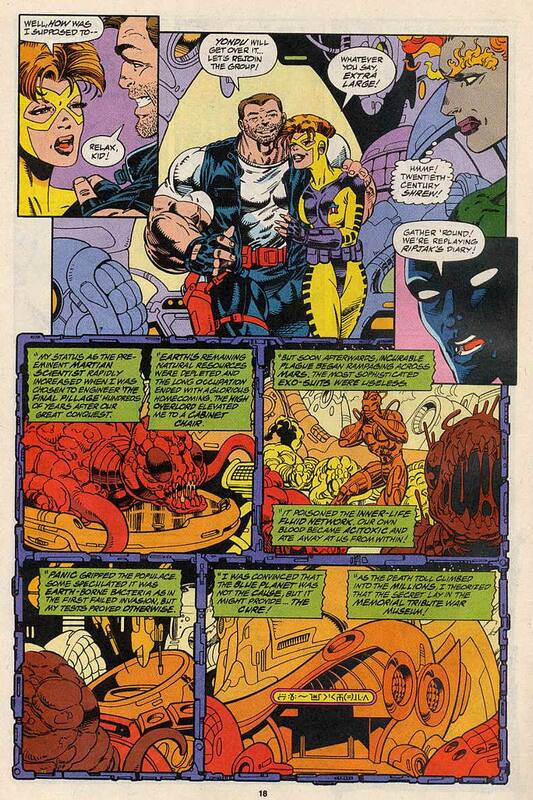 Bubonicus was the creature battled by the Galactic Guardians back in issue 35 and afterwards a report was produced by Martinex, which it looks like only Vance read, but as Talon points out, no one else knows about. Ripjak demands this information and after some more mutinous growling from Talon, they take him aboard. In the far reaches of the Galaxy, Starhawk finds a brooding Hollywood on an uninhabited planetoid. After hearing a tone from Starhawk he found similar to Mainframe, Hollywood attacks Starhawk. 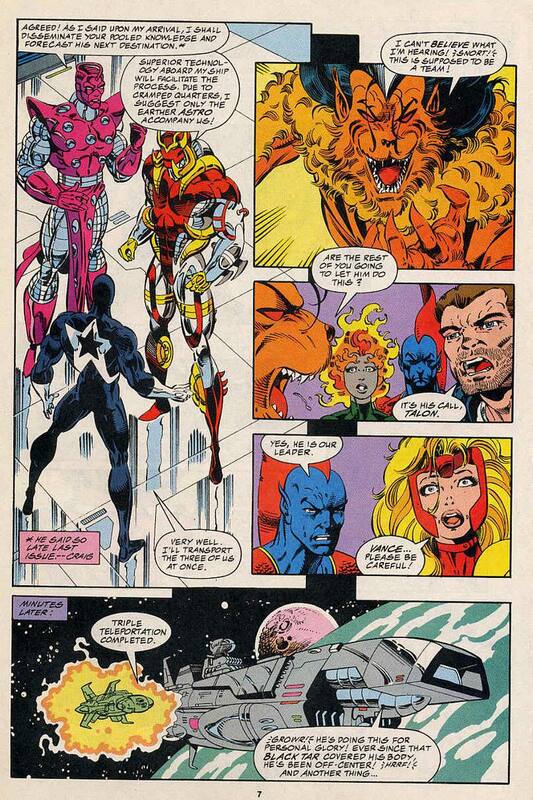 After a brief fight, Hollywood listens to Starhawk, who still seeks his family history and directs him to Norrin Rad, the former Silver Surfer. 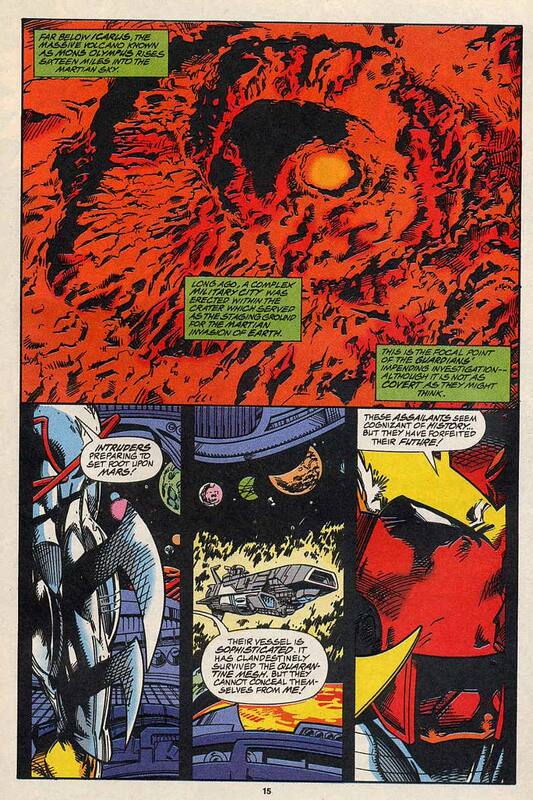 Starhawk leaves, but in gratitude tells Hollywood that Doom has returned to Earth. In a tense conversation on Icarus, Ripjak learns more about Bubonicus and asks for more of the Guardians’ aid. 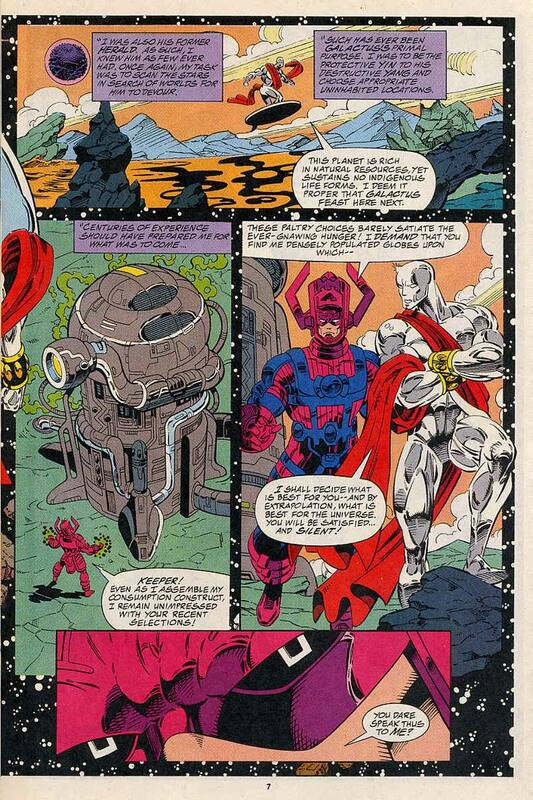 As this is considered, Icarus is breached by the arrival of a new player, the High Evolutionary. 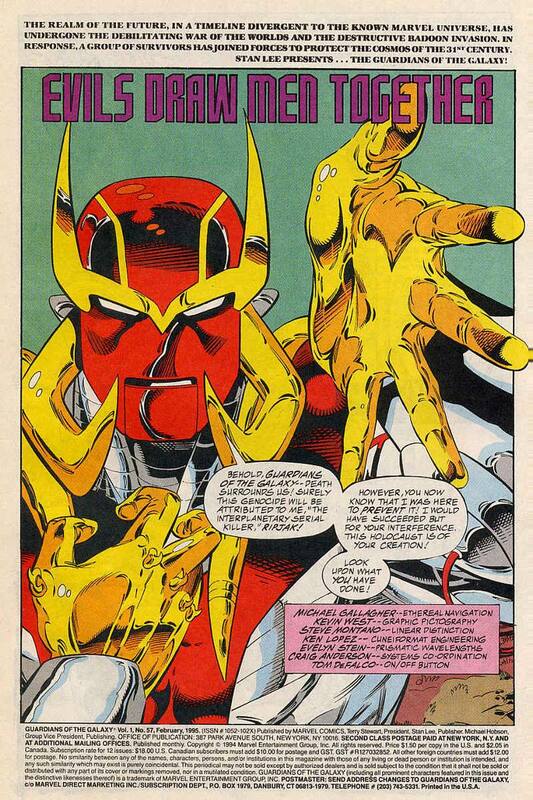 The High Evolutionary was a marvel universe supporting character first introduced in The Mighty Thor #133 and had a long history of popping up here and there before his starring role in the 1988 crossover Evolutionary War. 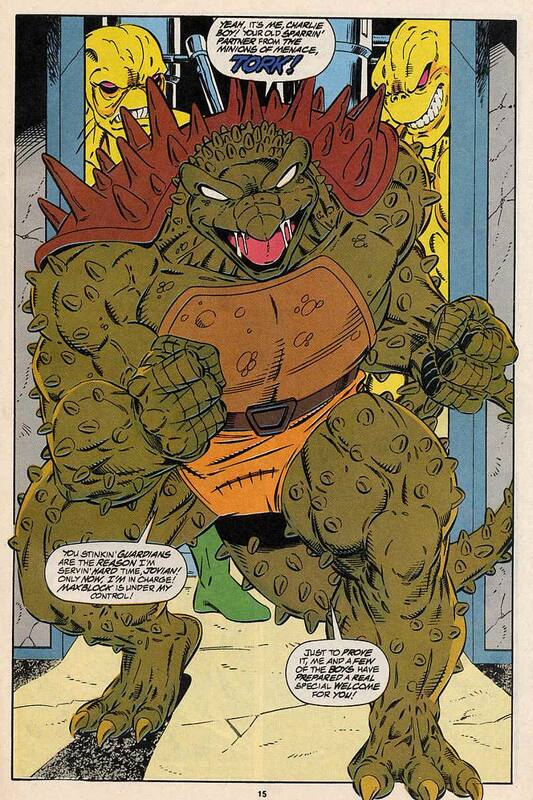 Since Stockade, Charlie-27 has had a tee-shirt under his vest, which does make more sense. 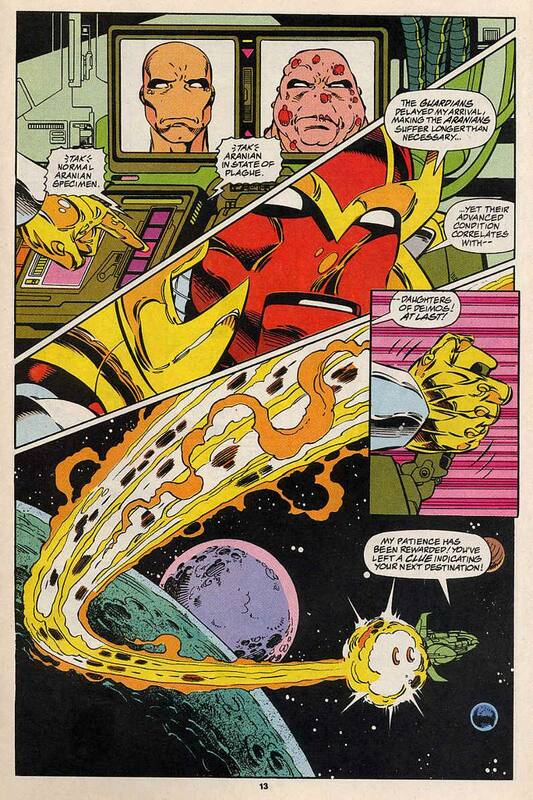 Yellowjacket has this whole attitude about Ripjak being a martian, despite the War of the Worlds not being part of her history. 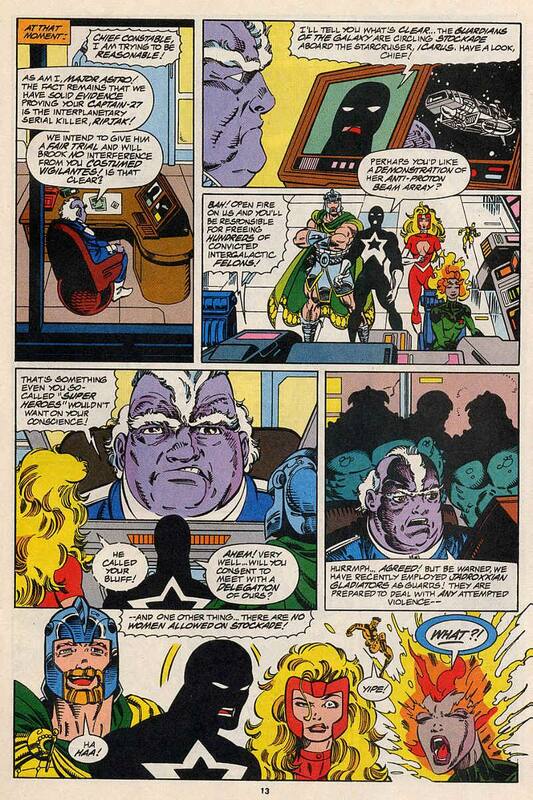 More fracturing of the team as the wheels start to come off the Guardians of the Galaxy. 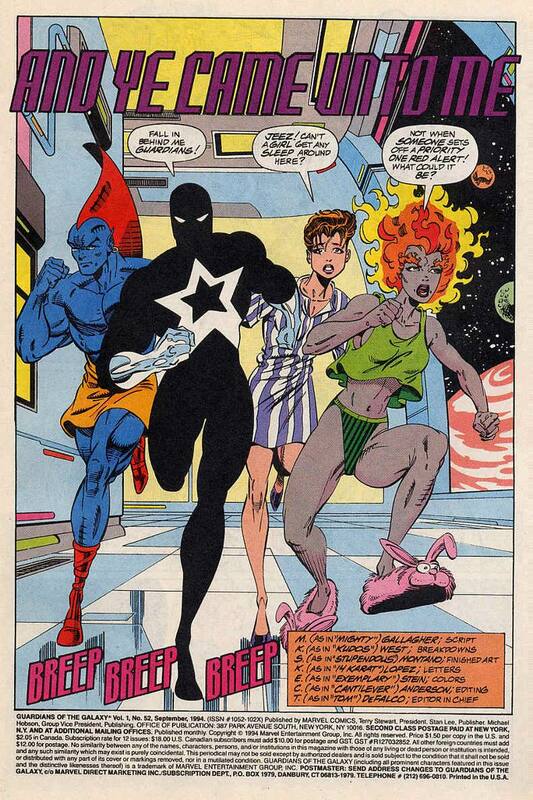 This is the real beginning of Starhawk’s story, which will run to the end of the series, but the who is Starhawk’s parents mystery being related to the Silver Surfer is a hell of a stretch. A decent enough issue, but its not just the team that looks to be coming apart. NEXT TIME: The hunt for Bubonicus. Guardians of the Galaxy 56 was cover dated January 1995 and was on sale in November 1994, sharing the spinner racks with Batman: Castle of the Bat #1, Cyclops: Retribution #1, Man Called A-X #1, Ninjak Yearbook #1, Star Trek Generations #1 and Tales of Suspense #1. 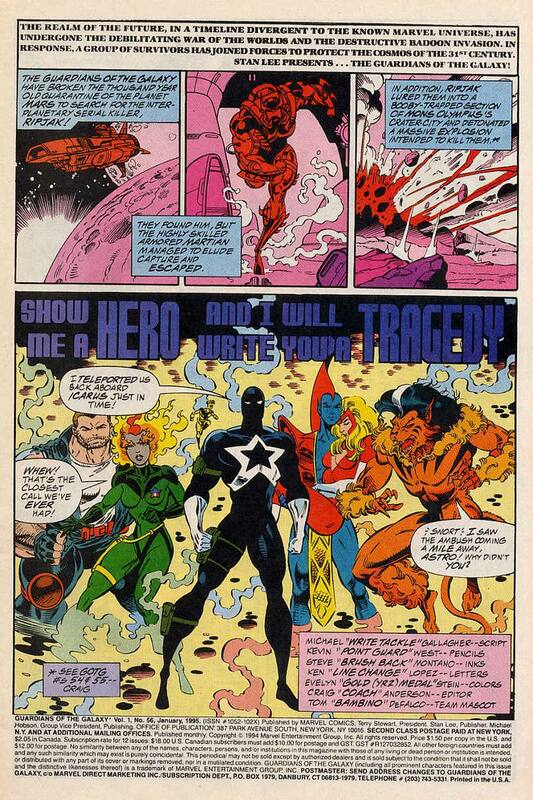 Show me a hero and I will write your tragedy was written by Michael Gallagher, with Kevin West pencils and Steve Montano inking and opens with the Guardians of the Galaxy tele-porting back to the Icarus. 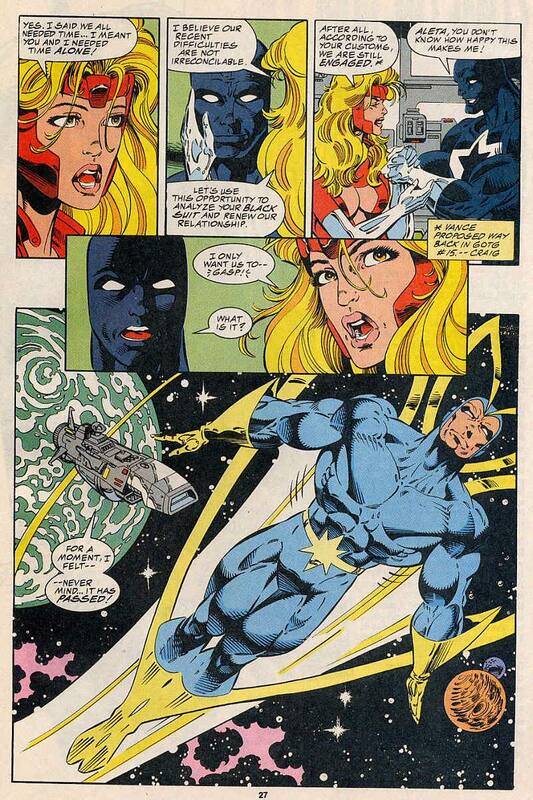 Aleta is sent with Yondu and Yellowjacket to sickbay while the rest of the team are put on the task of finding where Ripjak went. 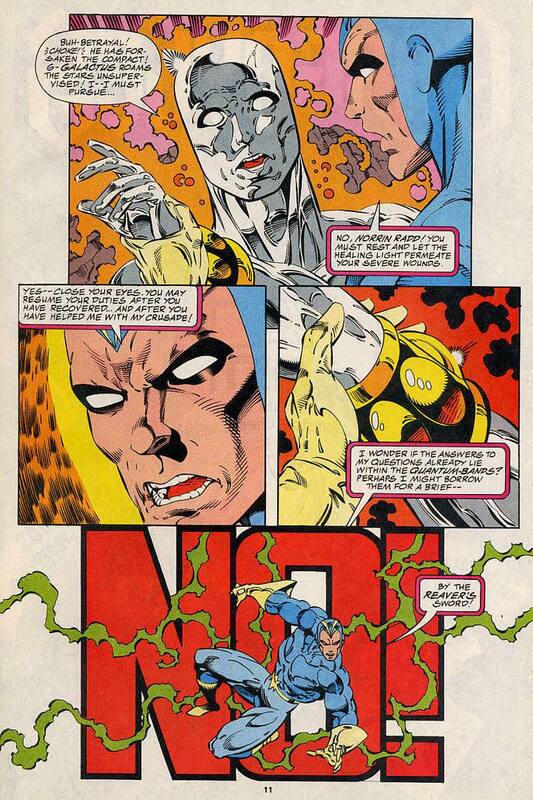 As Vance is left alone, the holo communicator is activated and Martinex’s image appears before him. 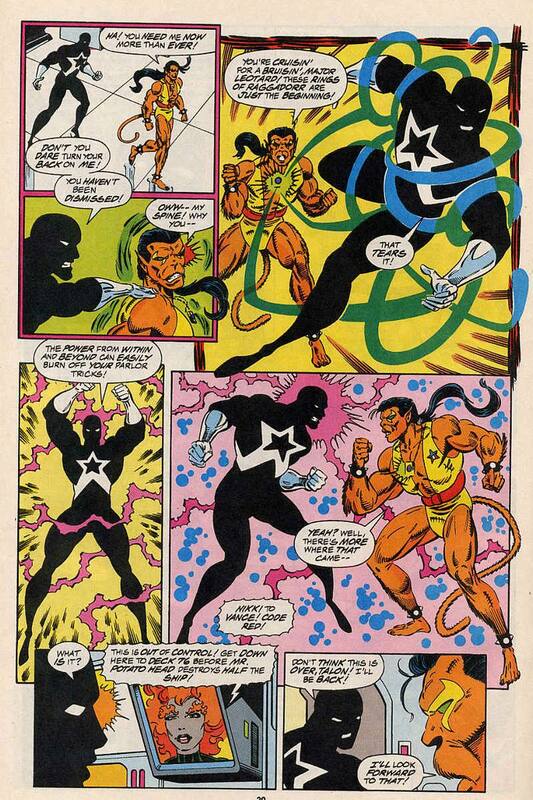 There is mention of Martinex looking like his old self, which the Galactic Guardians mini-series didn’t mention, although it’s how he looked there too. 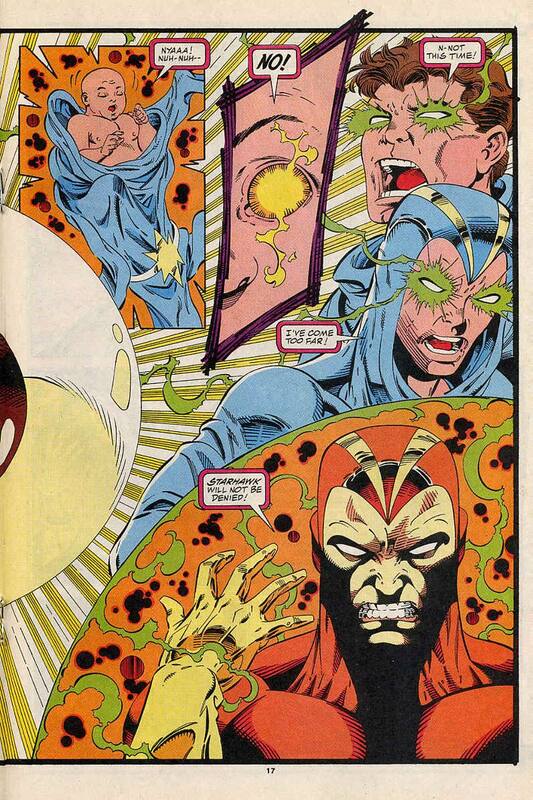 Martinex points out that he knows that the Guardians broke the quarantine and he is keeping an eye on them. To help? To stop them? It’s not made clear. 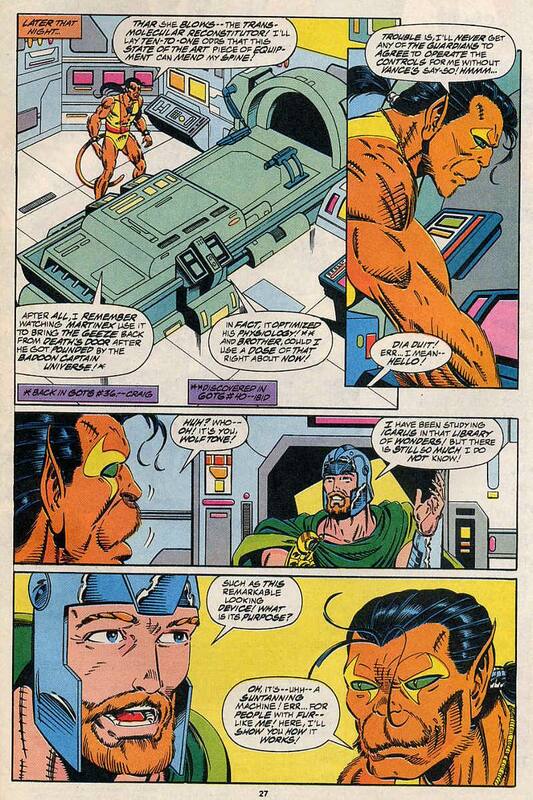 The intergalactic media points out that Aran IV has fallen to Ripjak and Talon goes in to tell Vance, mainly to rub his nose in it and warn him that he wants Vance’s job and will go through Vance to get it. While this is going on Charlie-27 and Nikki admit that this whole Stockade thing has made them both realise how much they feel for one another and there is a passionate kiss. Meanwhile we learn what Ripjak has been doing. He is actually chasing sightings of the plague that depopulated Mars and when he finds that there’s no way to cure it, mercy kills the populace to prevent the infection spreading, not too different from a culling to prevent a cattle based virus moving off the farm. 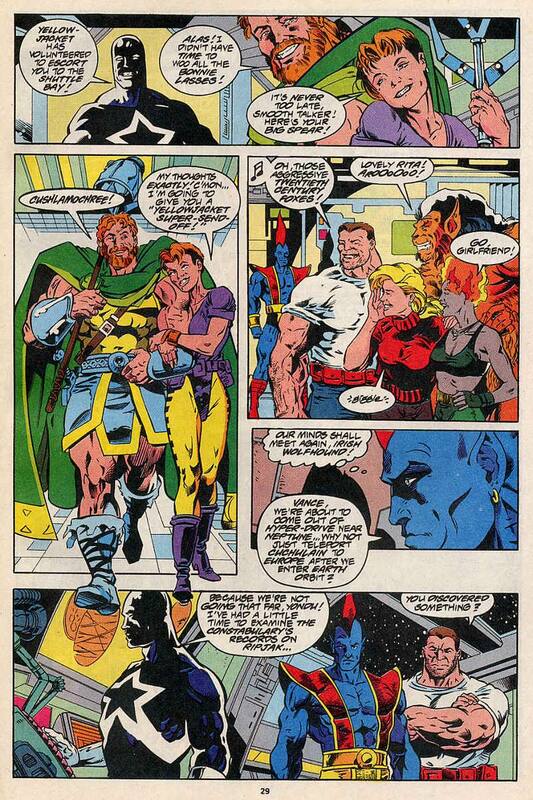 In sick bay on the Icarus, Yondu helps Aleta recover and Vance is visibly relieved that she is awake and in recovery, then they find Ripjak, the Tombaugh system. 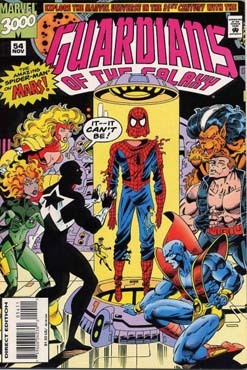 The team intercept Ripjak and battle with him, allowing him to show of the armoured spider-legs on his back, the battle is fierce, with the Martian holding his own and then Ripjak shows them the population of Tombaugh, all dying of the plague and their pain is there Guardians of the Galaxy’s fault. This was a better issue than the last one or two with more on point characterisation and a better paced plot. We get a great “Well that was close.” Resolution to the cliff hanger and the re-introduction to one of the team’s founders Martinex. The scene between Nikki and Charlie-27 is as touching as the one with Talon and Vance is annoying. We finally learn why Ripjak is killing worlds, it’s meant to prevent the spread of the plague that each world has fallen victim to. Put like that, the villainous view of Ripjak seems not as clear. The fight between the team and the spider-legged Ripjak is fun and a entertaining and shows Ripjak as a true threat when he just pushes away the whole team and shows them what he was trying to do. NEXT TIME: If they villain isn’t Ripjak, who is it? 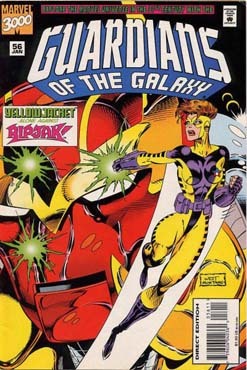 Guardians of the Galaxy 55 was cover dated December 1994 and was on sale October 1994, sharing the spinner racks with Backlash #1, Classic Star Wars: Return of the Jedi #1, Giant Size Prototype #1, Hulk 2099 #1, Mobfire #1 and Timewalker #1. 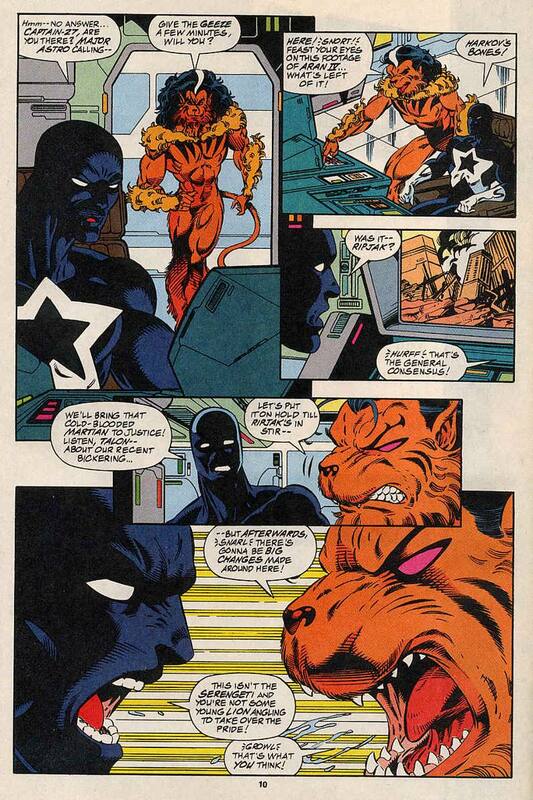 An eye like Mars to Threaten and Command was written by Michael Gallagher, inked by Steve Montano and pencilled by a returning Kevin West and opens with Ripjak kicking Talon who was hunting him. 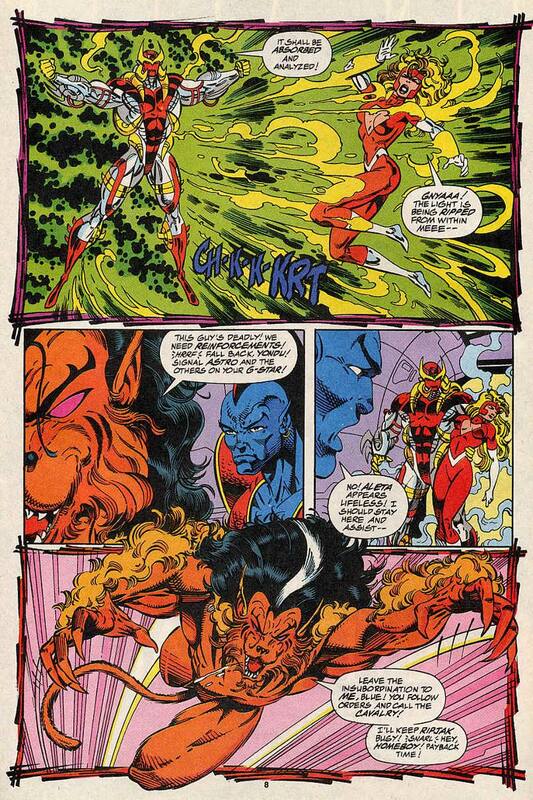 After a brutal tussle which injures both Talon and Yondu and leaves Aleta with her light energy ripped from her, Ripjak simply leaves, Yondu had already called for help, but Ripjak is already on his way to Aran IV. 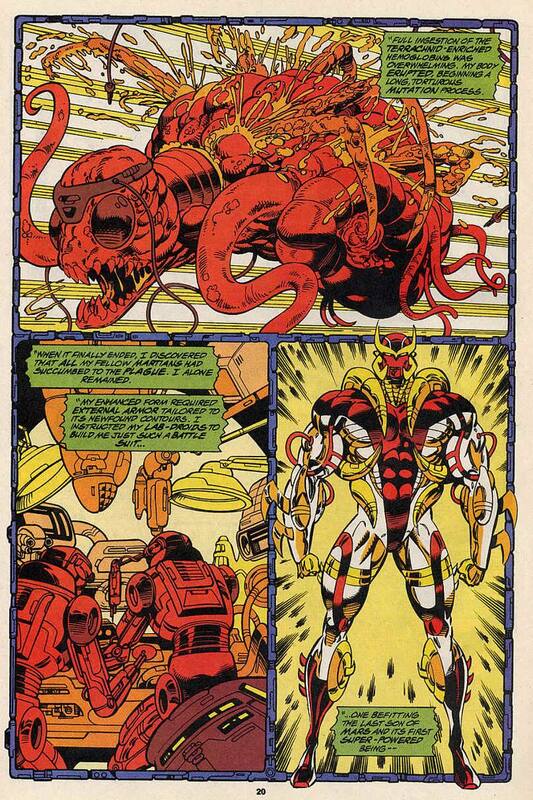 Vance uses the Martian technology to look at Ripjak’s history and how the plague tore through Martian society, leaving them desperate enough to remove the corpse of Spider-Man (first mentioned last issue) and attempt to use his radioactive blood to immunise their people. After being horrifically mutated by Peter Parker’s spider DNA infused blood, Ripjak awoke to find all of his people already dead. After the Guardians learn this, Ripjak contacts them and tells them that they can’t survive with this information and blows up the facility remotely. Ripjak lands his ship on Aran IV and proceeds to destroy the whole planet in an extended four page sequence, before his ship flies away. 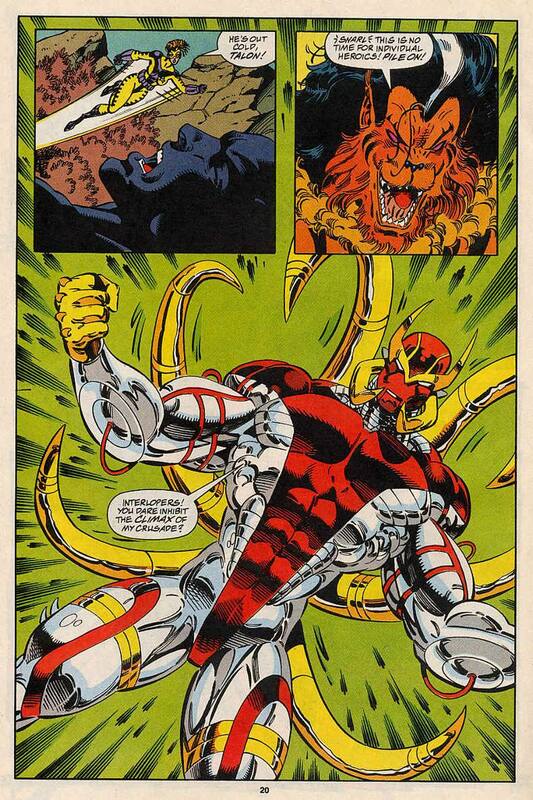 Another filler issue, but at least there were a couple of nice moments. 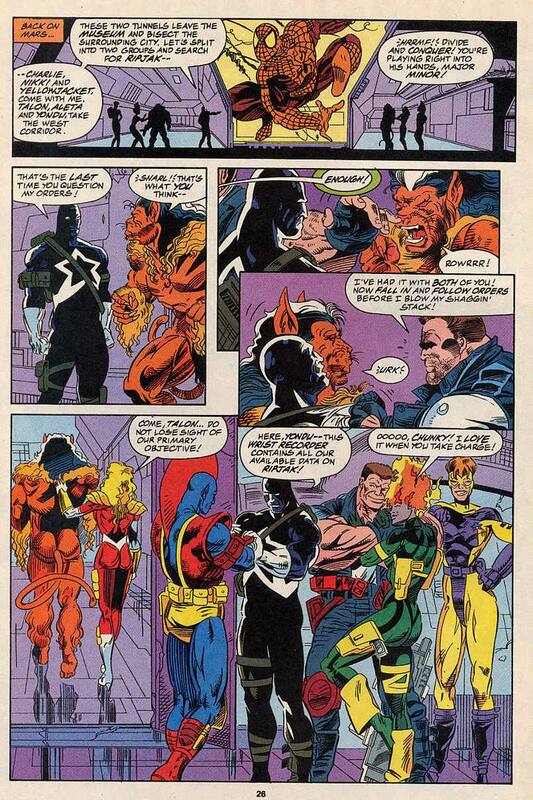 More subplots are furthered with the Talon’s insubordination thing becoming more of a defining character trait. 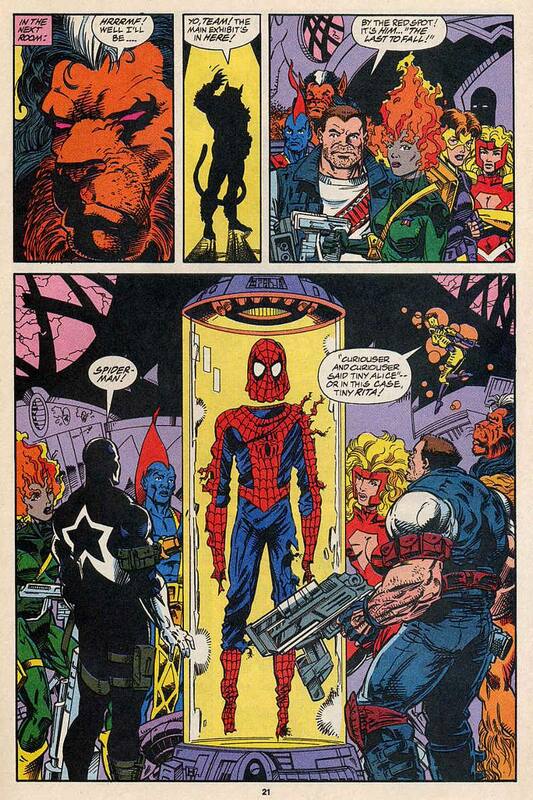 The connection between Ripjak and Spider-Man is interesting and the plague story gives a bit of pathos to Ripjak. 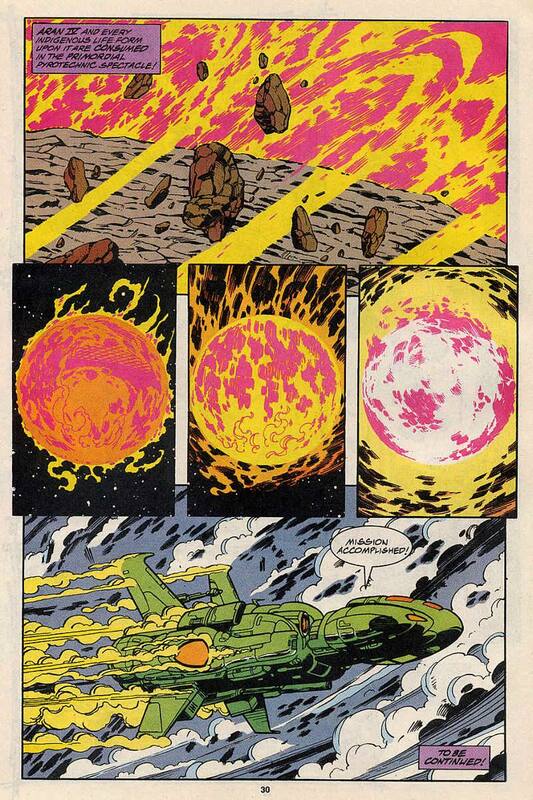 Ripjak blows up both the building the Guardians are in and the planet of Aran IV for a reason we still do not know and there is a painstaking description of the planet’s ultimate destruction, it’s an odd place to take such a long time and it costs some drama. 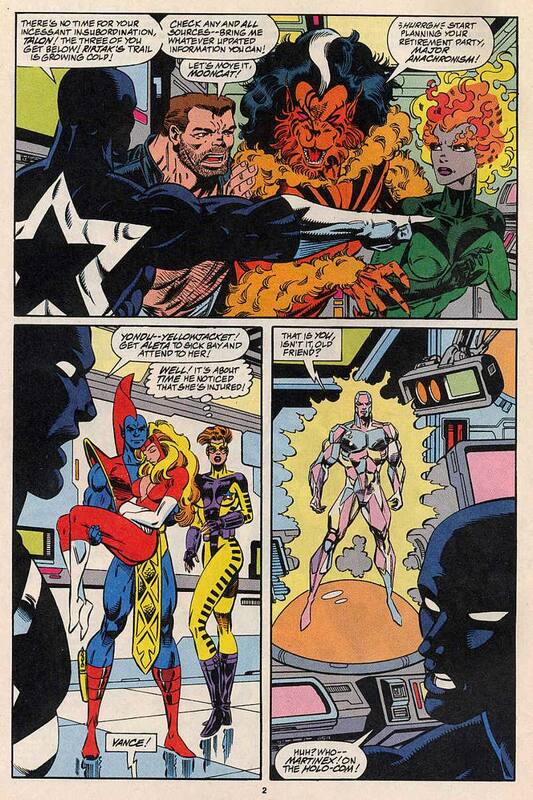 Overall a good issue, there are a few nice moments where Vance can’t show too much concern for Aleta and Yellowjacket watching it all unfold. 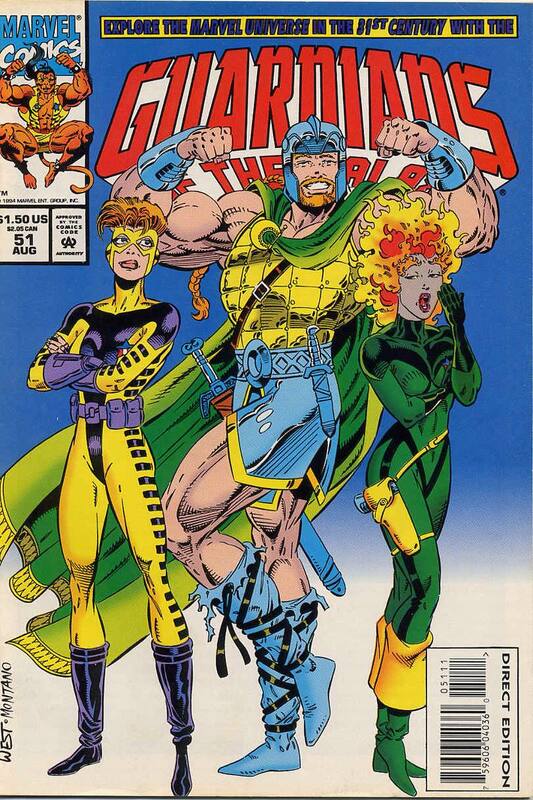 Guardians of the Galaxy 54 was cover dated November 1994 and was on sale September 1994, sharing the spinner racks with Action Comics #0, Fantastic Force #1, Guy Gardner: Warrior #0, Psi-Lords #1, Timecop #1, Turok: Dinosaur Hunter Yearbook #1 and X-Factor #108. 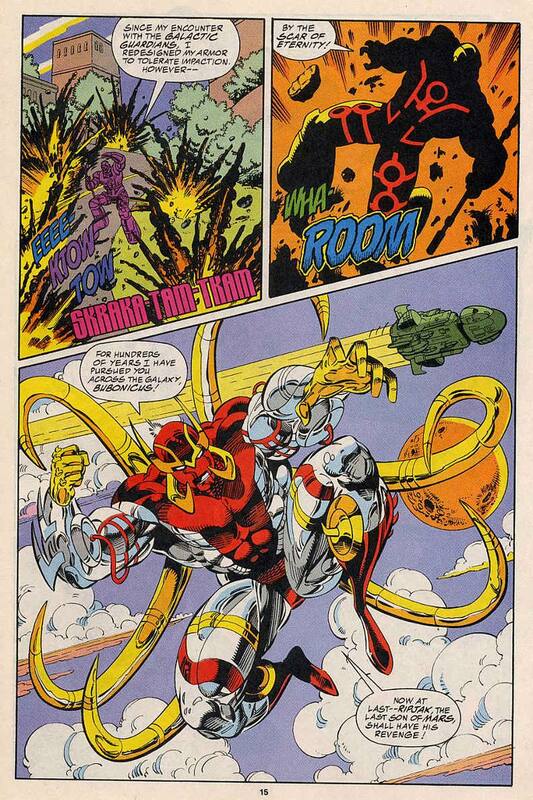 The spiders of mars was written by Michael Gallagher, guest pencilled by Scott Eaton and inked by three inkers, none of which were Steve Montano and opens with Icarus orbiting the quarantined planet of Mars. There is some bickering on the bridge, including questioning of Vance by Yondu, who is still very disturbed by the idea of his god being Thanos. 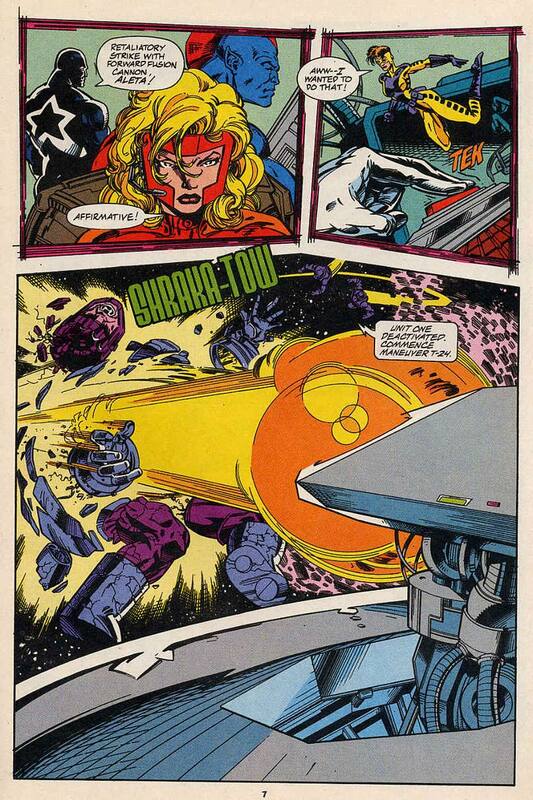 As peace between the old friends is restored, the ship is attacked by Sentinels. The ship takes care of them fairly easily and the Guardians tele-port down to the surface of Mars. The team find a museum for the War of the Worlds, as the aliens who attacked Earth had retreated to Mars. Vance finds a hall of fallen heroes, artifacts that have been there for over a millenium. 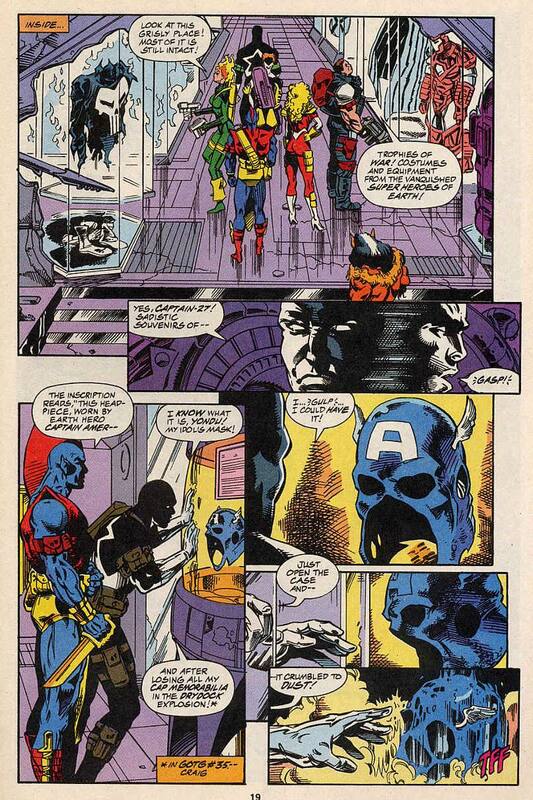 Amongst these is the mask of Captain America, which crumbles as Vance reaches for it, to replace his lost Captain America memorabilia. 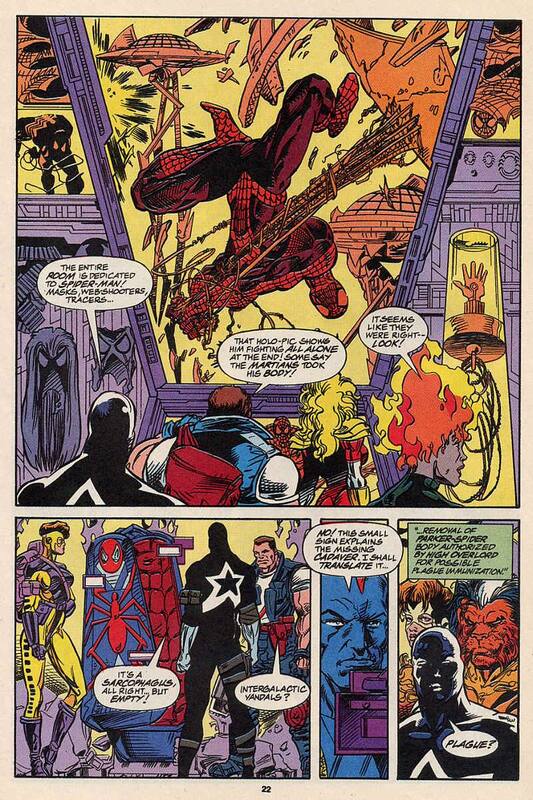 At the end of the hall, they find a monument to the last to fall, Spider-Man. The display also includes his corpse, which was removed to help with plague immunisation. 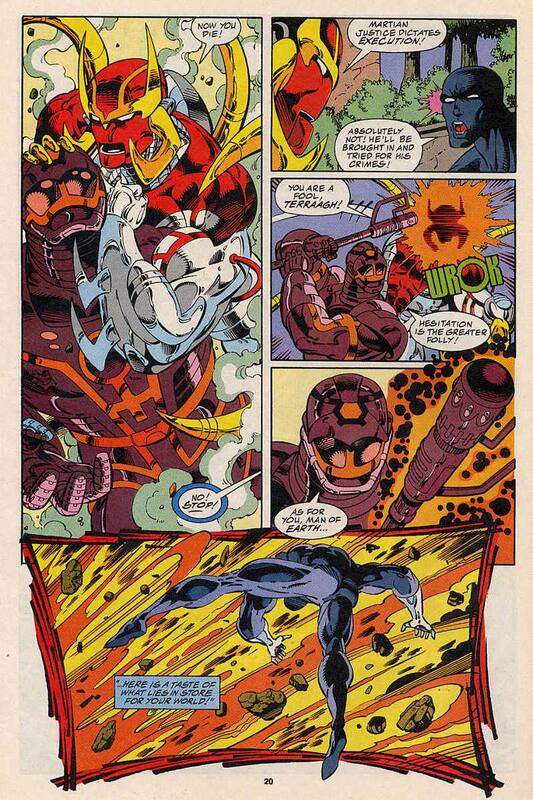 The team then decides to search for Ripjak, there are two paths leading Vance to split the team. 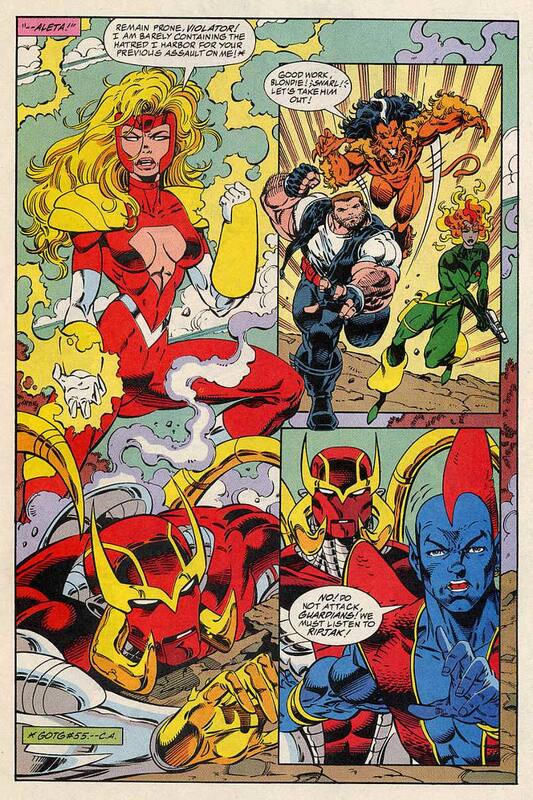 Yondu, Talon and Aleta take one path, whilst Vance, Charlie-27, Nikki and Yellowjacket take the other. Talon again butts heads with Vance over there and it’s only when Charlie steps between them, that this is ended and the teams split up. Yondu’s team is being observed, just as the whole team was as they arrived. As Talon becomes more animal like, he can smell someone and heads off, the other two following. Their target, the armoured Ripjak, waits for them, they will be the next to die at his hands. Notes: Now we’re very much inside the Ripjak saga which will take up this and the next four issues and is the last big story before the title’s end. 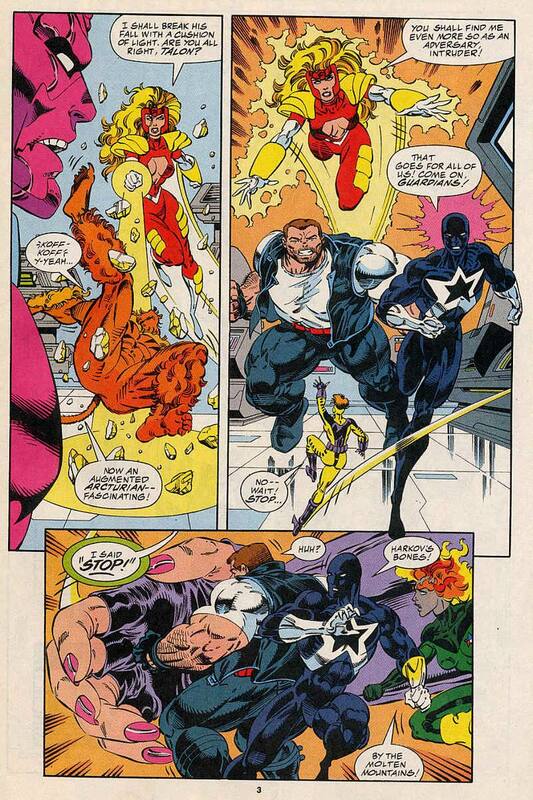 With a guest penciller and three guest inkers, the art is a little inconsistent as are the character’s looks and it would normally be a problem, but the tone matches the art and it all seems to work out. The cracks are starting to show in Vance’s leadership and at least three of his team get on his back for his actions in this issue alone. 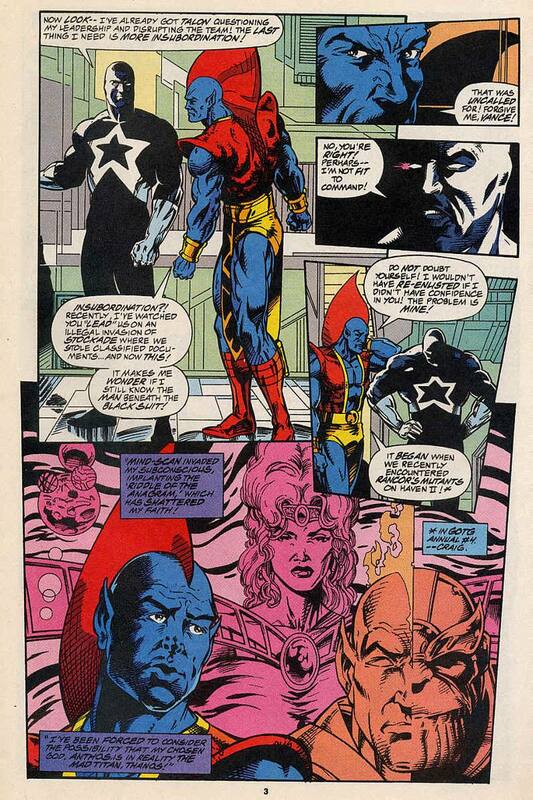 We have more mention of Yondu’s spiritual crisis and there’s also the start of Starhawk’s quest to learn his true history. 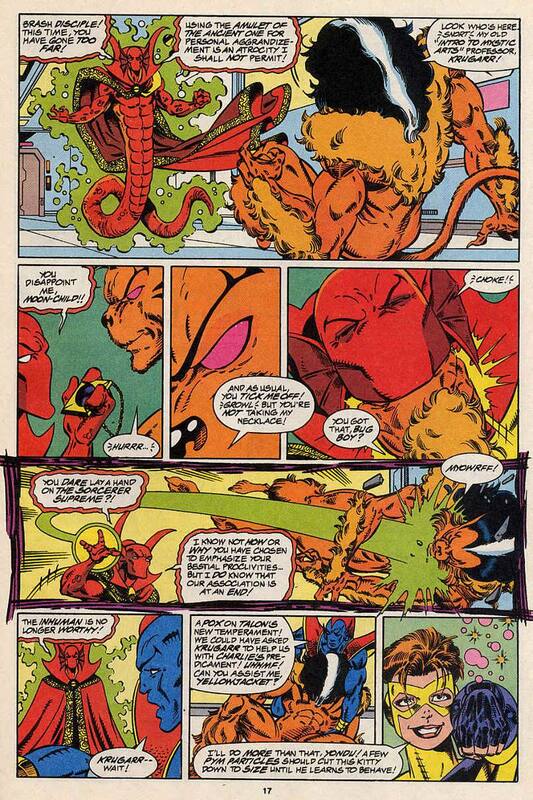 We’ve had FF villains, Avengers and mentions of the X-Men, but this issue is the first real mention of Spider-Man. Of all the heroes in the Marvel Universe, the one you would expect to last beyond the rest is Spider-Man, he’d never give up and would keep fighting long after it would cost him his life. This mention of plague immunisation plays into the Ripjak story later. The atmospheric nature of the story, makes it a bit like a horror story in space, I liked that idea, very Dr Who. The design of Ripjak is…. not what I was expecting. 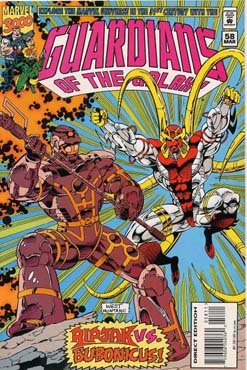 Guardians of the Galaxy #53 was cover dated October 1994 and was on sale on August 1994, sharing the spinner racks with Adventures of Superman #0, Ectokid Unleashed #1, Fate #0, Flash #0, Oh My Goddess #1, and Zero Hour #0. 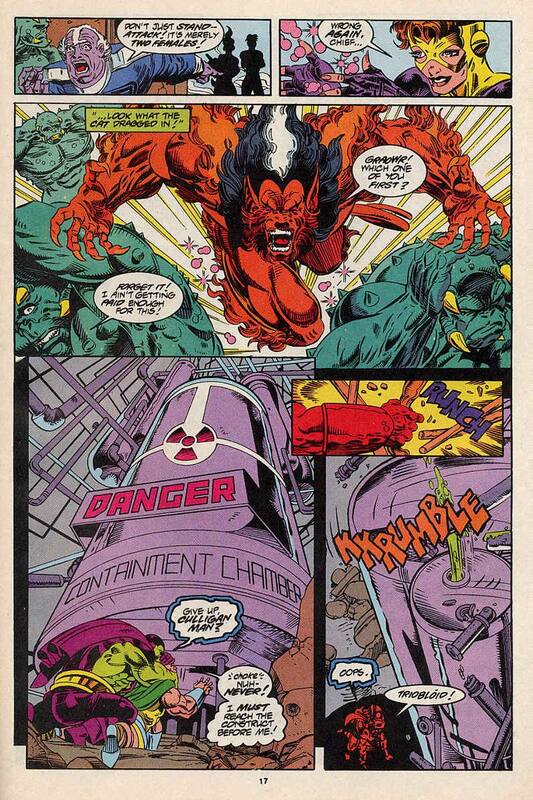 Into the Belly of the Beast was written by Michael Gallagher and inked by Steve Montano, guest pencils were from Scott Eaton who opens the story with Drax the Destroyer running into the Warden’s office to battle Cuchulain: the Irish Wolfhound over his TV programmes. This starts a massive brawl across the inside of Stockade, which takes up I’d say about 2/3 of this issue. 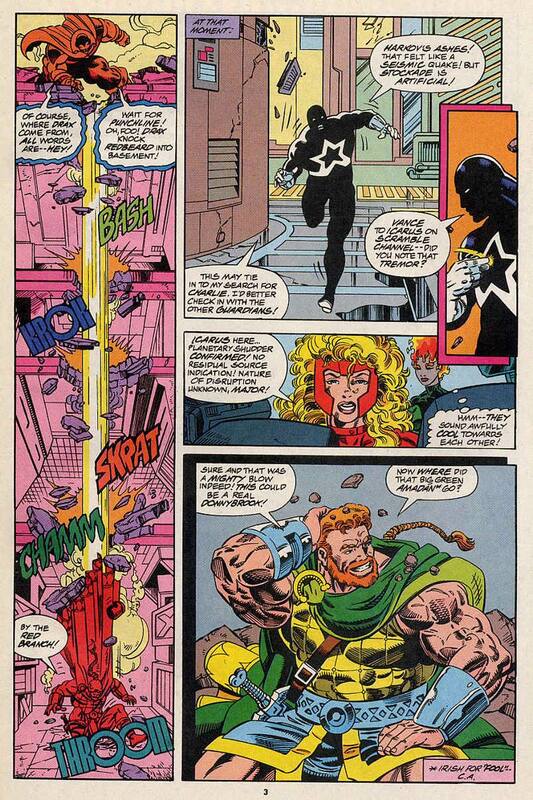 The rest of the team then board the station and hold the Warden hostage while the fight below causes a massive explosion. 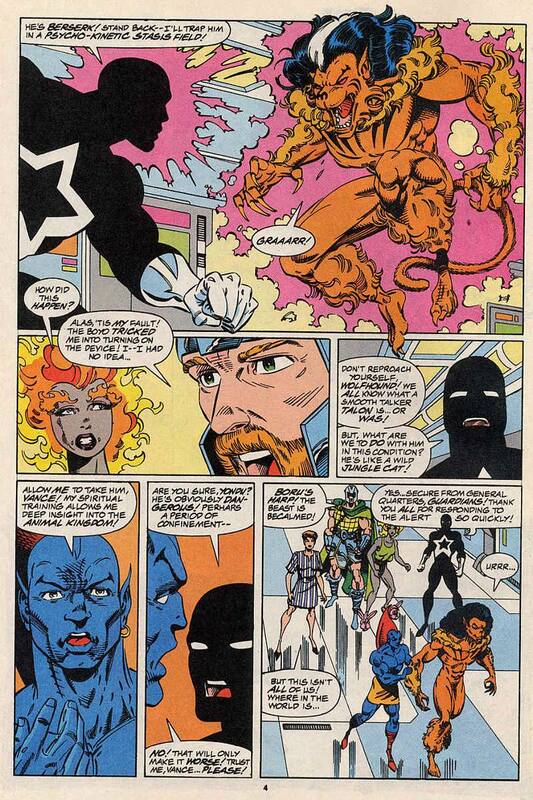 Vance has the team and the warden teleported to Icarus, leaving Chuchulain with Drax. Back aboard the Icarus, Vance, Aleta, Nikki and Charlie talk to the Warden and point out that image used to incriminate was a set up as it didn’t display Charlie-27’s scar which runs the length of his cheek, courtesy of the Spirit of Vengeance. Vance calls the Warden out on his glory-hound tactics and declares that the Guardians will pick up the search for Ripjak now. 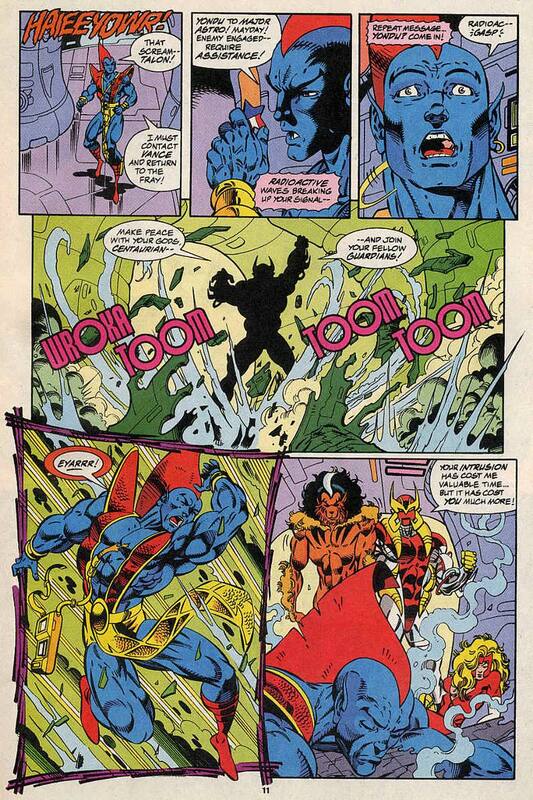 Before they leave, Yondu and Talon retrieve Cuchulain who thoroughly enjoyed his fight with Drax, despite the damage caused. 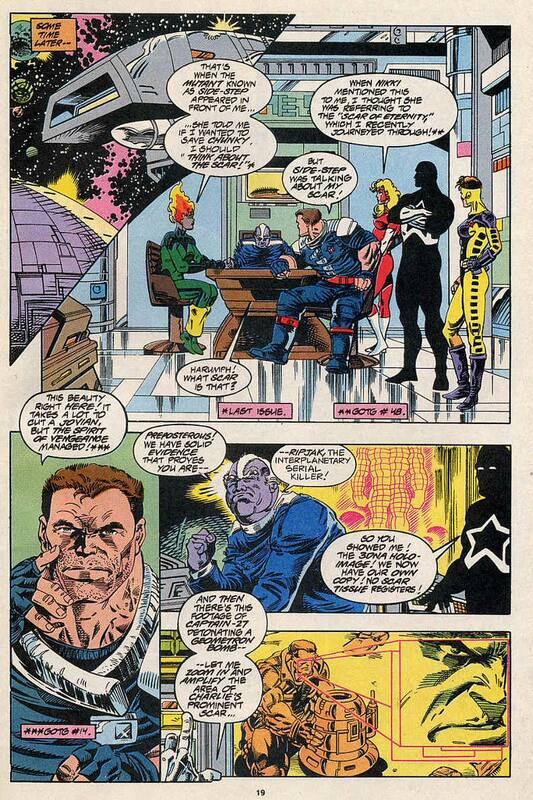 Yondu asks if Drax mentioned Thanos, but Cuchulain confirms he didn’t. 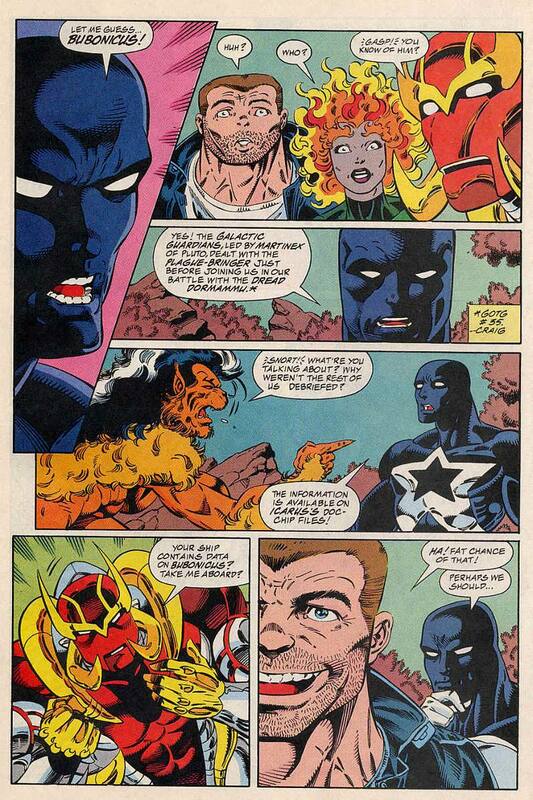 Yondu is visibly upset. They all return to the ship, leaving Drax to climb out of the rubble and begin to watch it as if it were television, once again becoming calm and child-like. 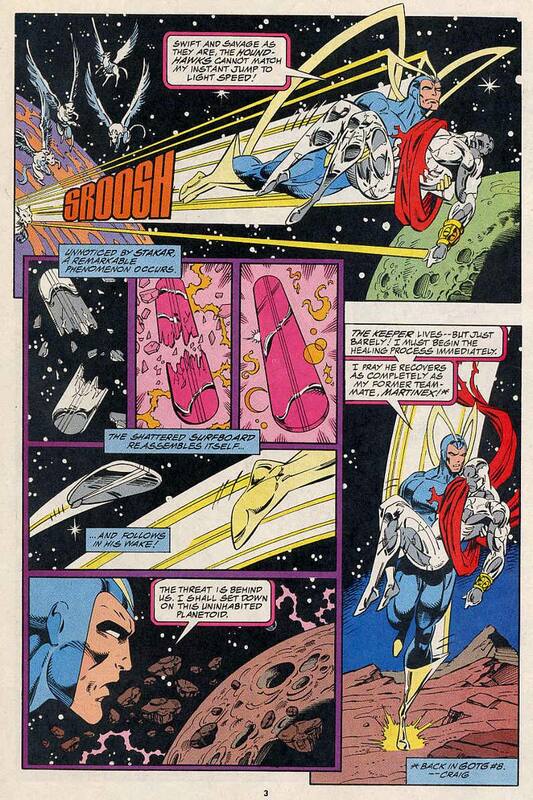 After returning the Warden, the Icarus returns to the solar system and Yellowjacket and Cuchulain take a shuttle to Earth. Following a lead from the information taken from Stockade, the Guardians find a new place to start looking for Rijack. The quarantined planet of Mars. We have about 6 pages of plot with about 14 pages of punching and it’s all fun. 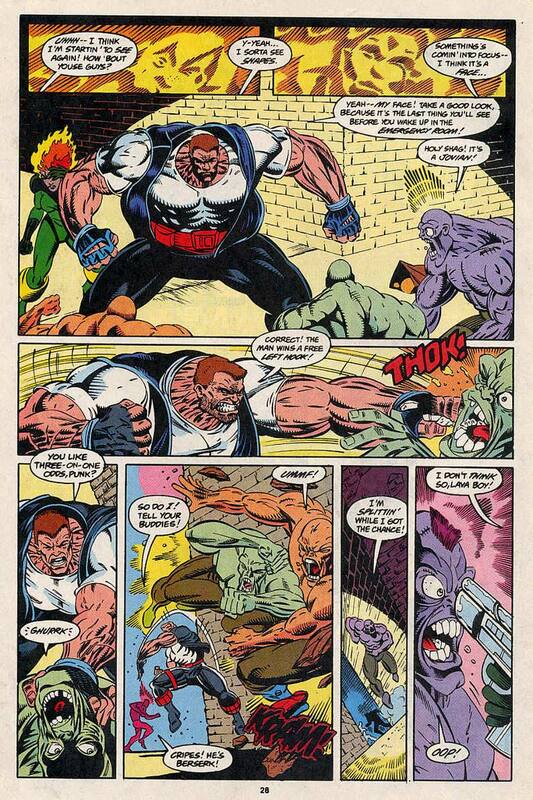 The fight between Drax and Cuchulain takes up most of the issue and is very enjoyable and mayhem filled. Vance is great here too, very much in command in getting to Charlie, but understanding enough to give Charlie a few minutes to pay Tork back. 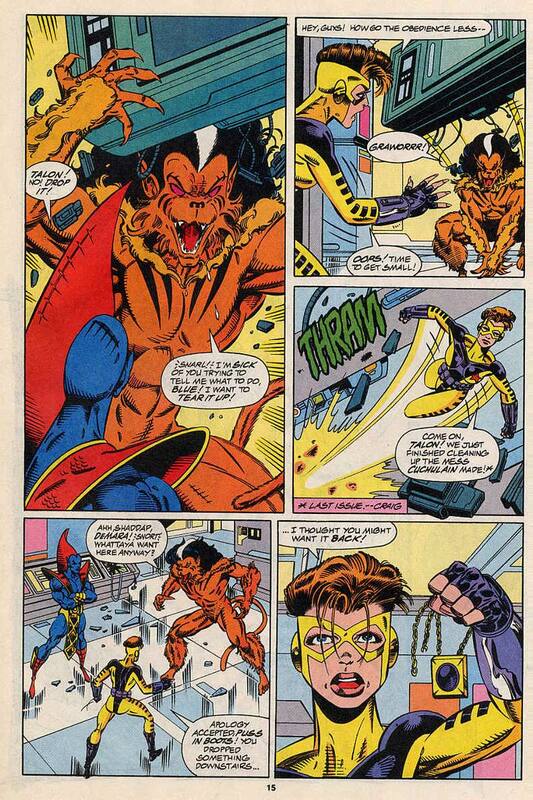 Yellowjacket’s use tactical use of Talon is pretty good. 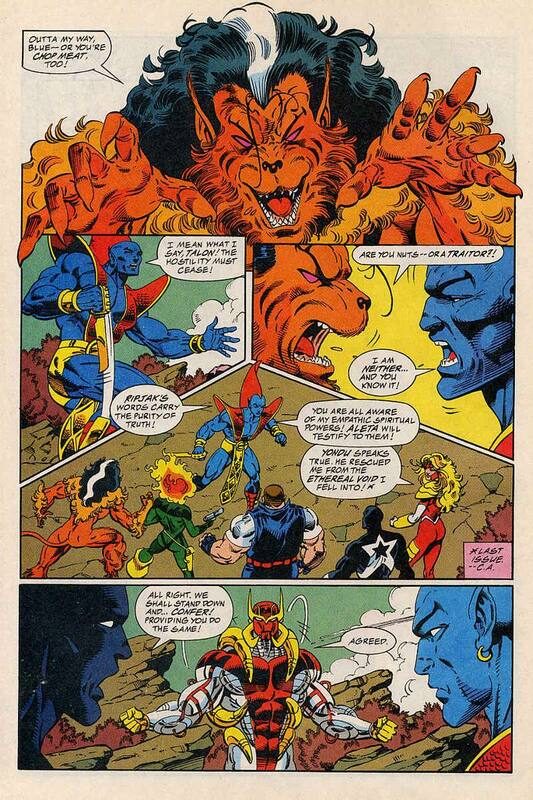 We return to the sub-plot of Thanos being the spirit god of the Centaurians, Anthos and it’s effects on Yondu. 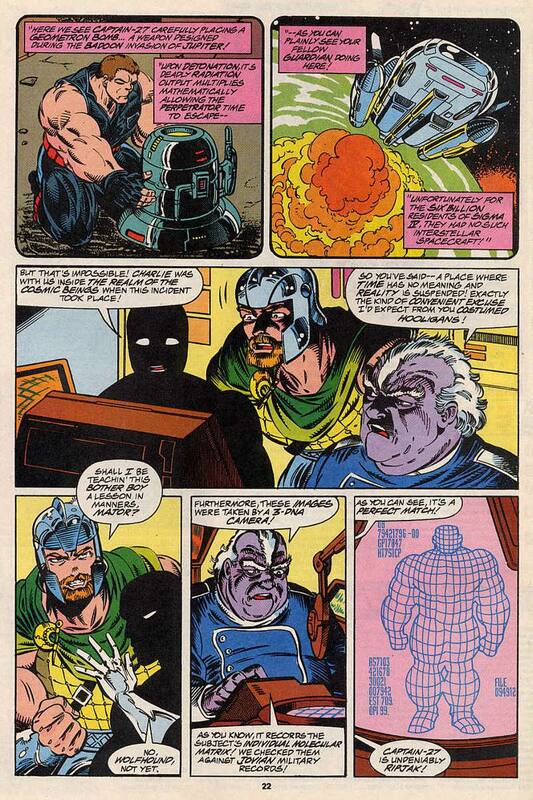 Yellowjacket takes Cuchulain to the shuttle and it’s implied that some non-comics code approved stuff goes on. NEXT TIME: The rest of the team head to the planet used as the staging ground for the War of the Worlds, the forbidden planet of Mars. Guardians of the Galaxy 52 was cover dated September 1994 and was cover dated July 1994, sharing the spinner racks with Animal Man #75, Concrete: Killer Smile #1, Giant Size Matra #1, Solo #1, Spider-Man 2099 Annual #1 and Wetworks #1. 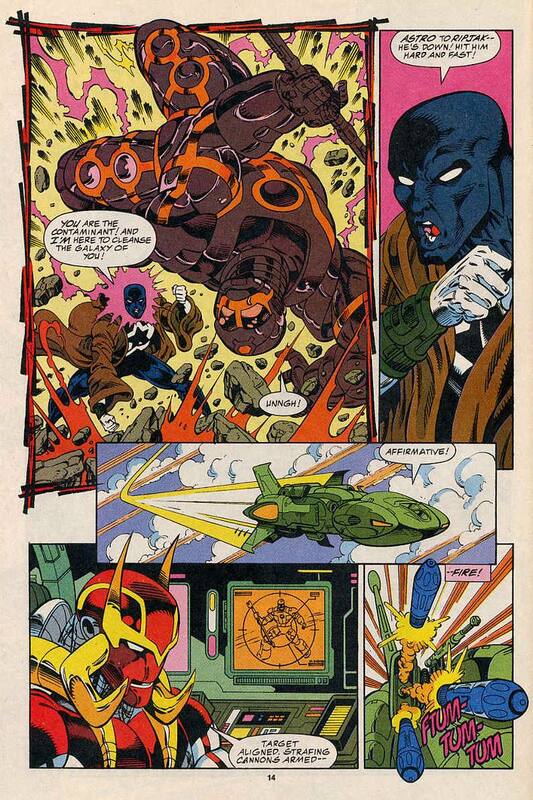 And ye came unto me was written and drawn by the usual suspects, words by Michael Gallagher, pencils by Kevin West and inks by Steve Montano and opens with an alarm getting Yondu, Vance, Nikki and Yellowjacket out of their beds and the crew racing to find Cuchulain being thrown through a bulkhead by a ferocious Talon, enhanced by the Trans-Molecular Reconstitutor. 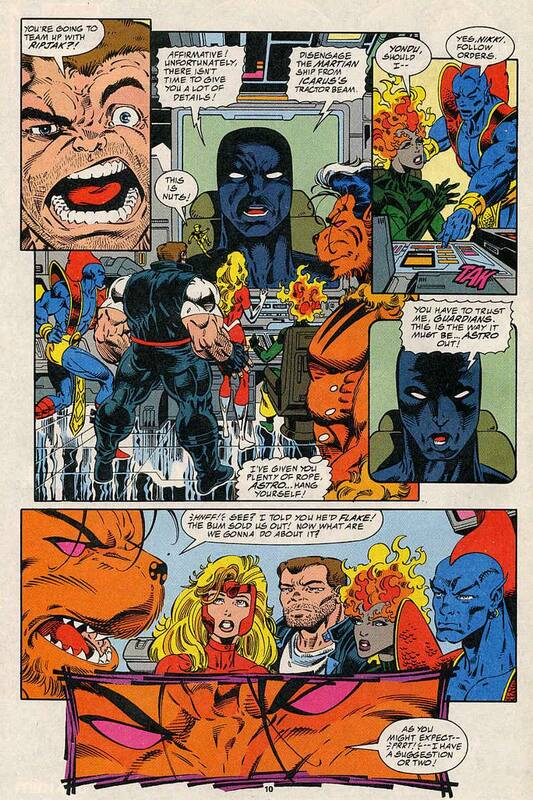 Vance steps in and splits the pair up, the girls take Cuchulain to make sure he’s ok and Yondu offers to help the almost feral Talon while he is in such an agitated state. 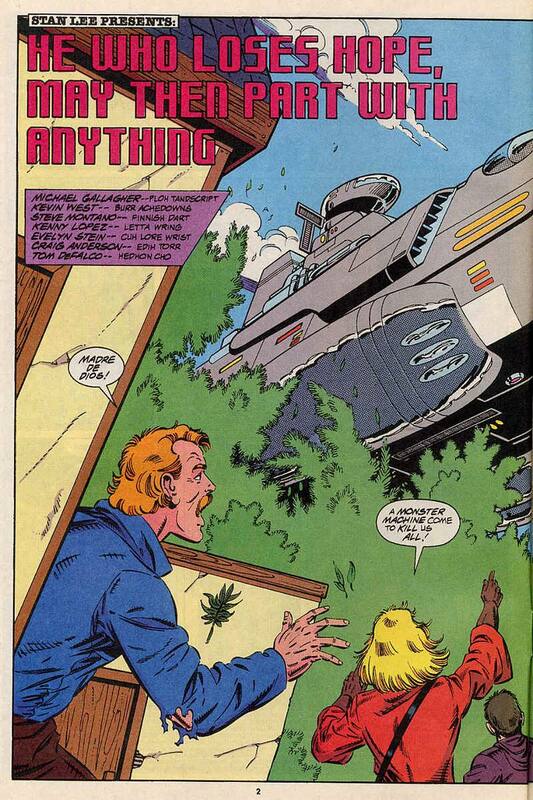 Vance then tries to find Aleta who is training. 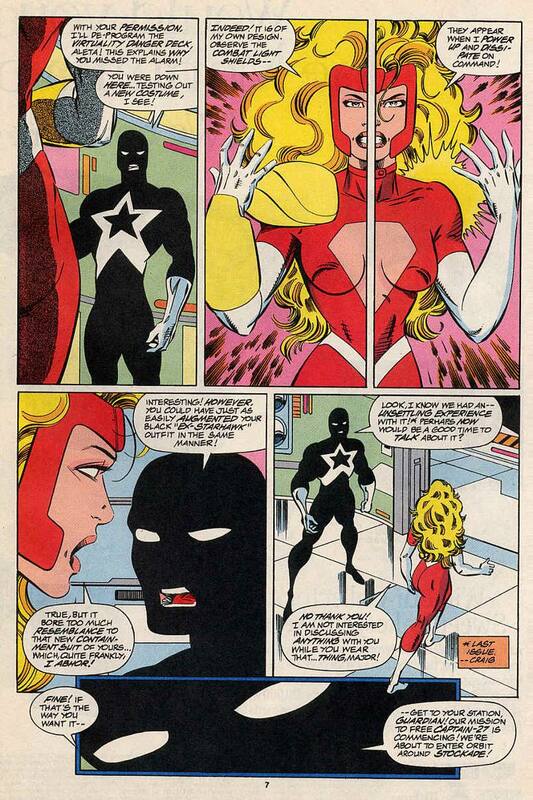 After showing off her new costume, she rebuffs him. Tired of this hot and cold from her, he tells her to man her station and prepare to enter orbit of Stockade. Meanwhile on Stockade, Charlie-27 is still getting beatings from Tork and his goons and the guards are still keeping him from the infirmary till he signs the confession of crimes he did not commit. 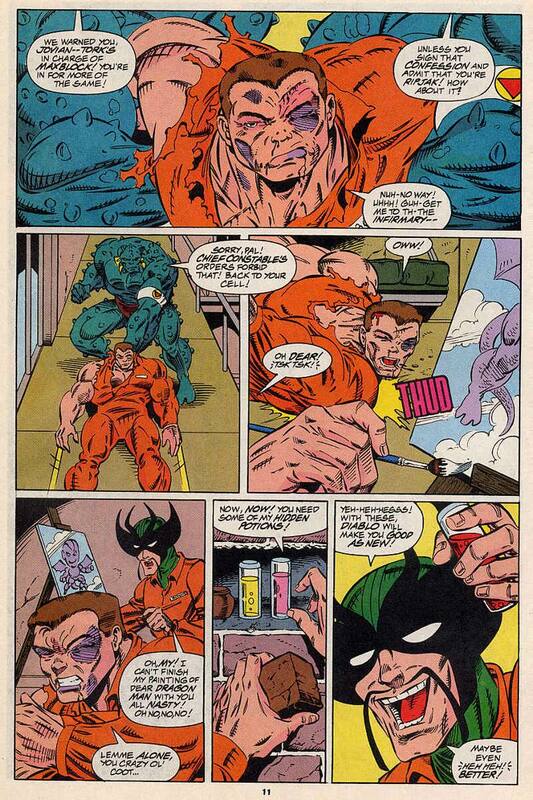 Dropped back in his cell, Charlie-27 is in a bad way, Diablo, his clearly unhinged cell-mate offers him potions to make him good as new, or maybe even better. The Guardians speak to the Warden of Stockade, who agrees to allow a delegation to come to Stockade, on the condition that there are no women. The women on the Icarus are enraged, but Vance decides to make use of this. 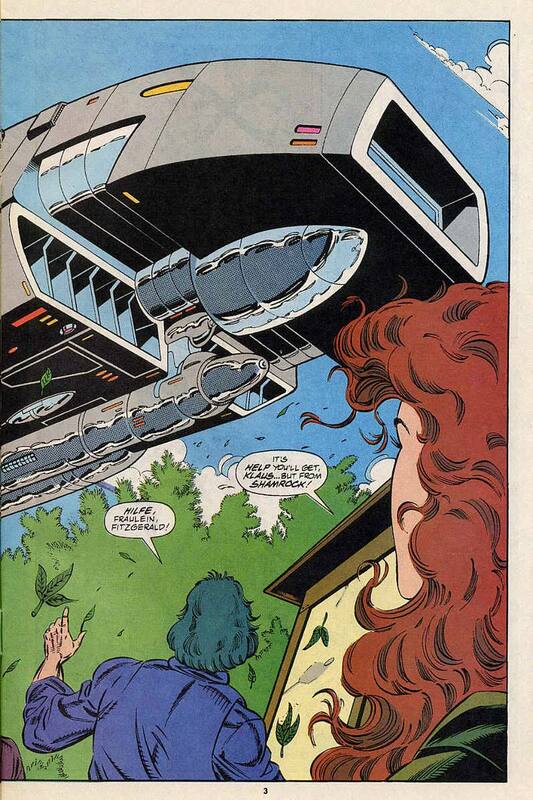 Nikki, Aleta and Yellowjacket are to remain on the ship at battle stations, while Vance and Cuchulain go down and talk with the Warden. 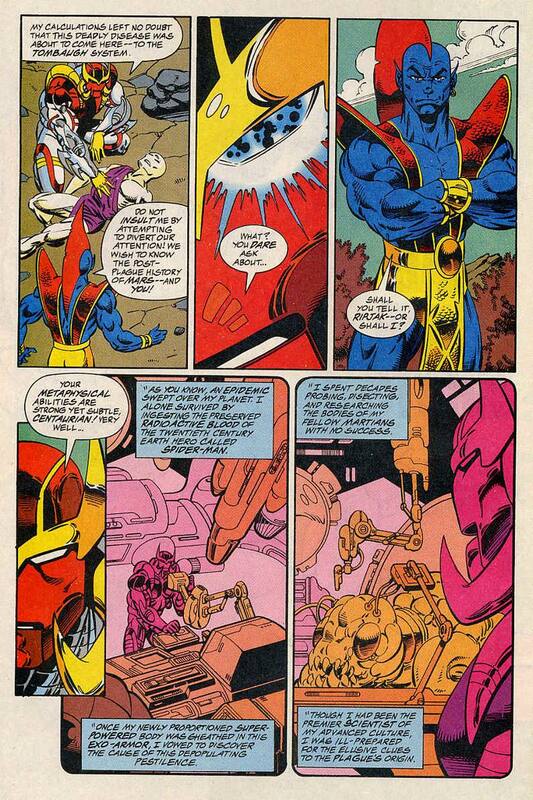 Elsewhere on the ship, Yondu is having a hard time calming the increasingly hostile Talon, Yellowjacket tries to give Talon his amulet back, thinking it may be a calming influence. Instead it makes him more power hungry and with this in mind he grabs the amulet. 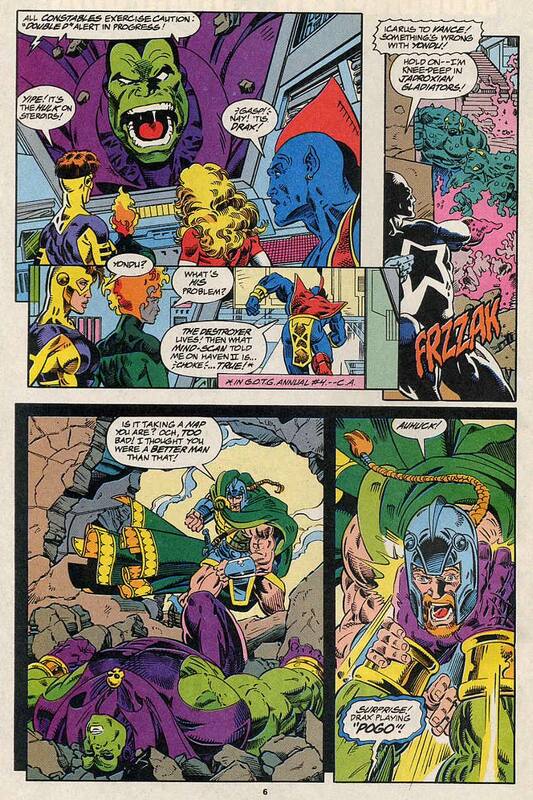 Krugarr, the Sorceror Supreme appears before them and admonishes Talon for his intent with the amulet. Talon is having none of that and grabs Krugarr by the throat. 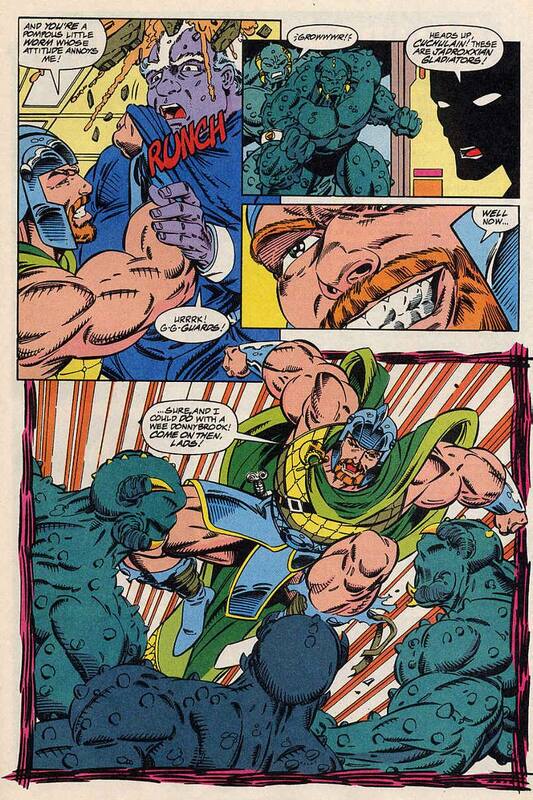 Krugarr swats him away, clearly furious with how Talon has changed and ends their association, taking the amulet and tele-porting away before Yondu can ask for his aid. 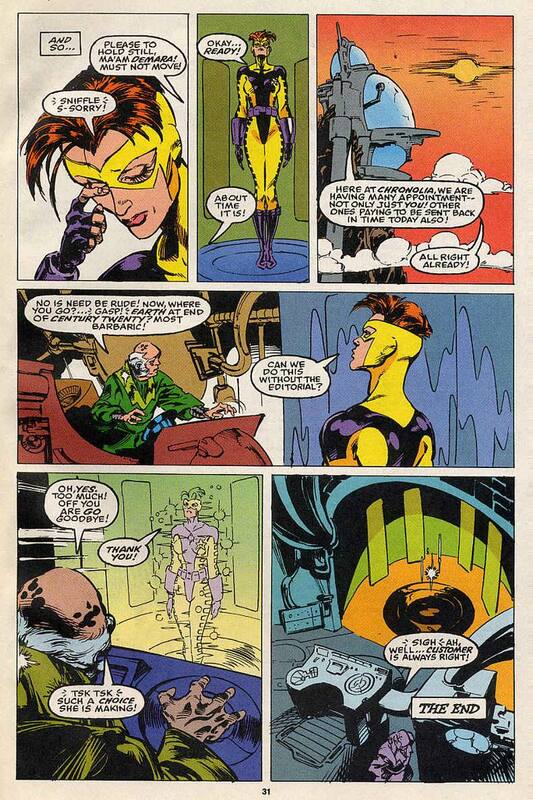 Yellowjacket offers to shrink Talon down to make him more manageable. 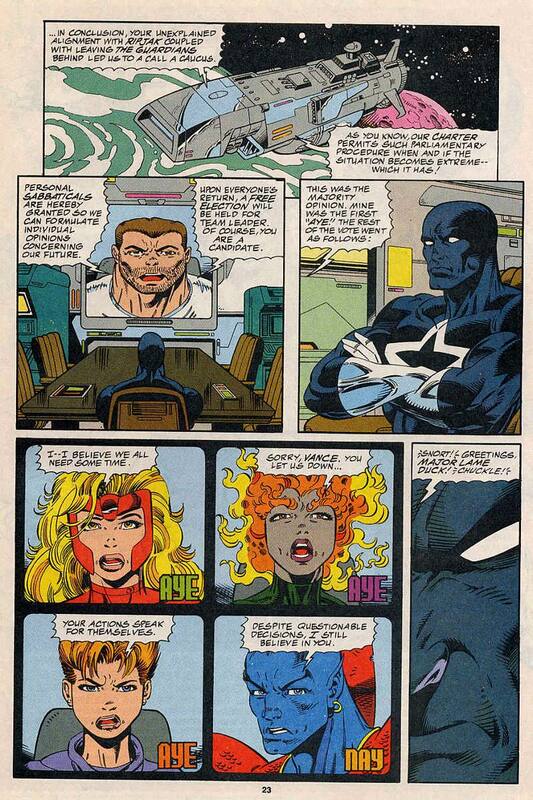 On Stockade, the Warden shows Vance the proof her has, including a recording which shows Charlie blowing up a planet and the DNA records which match Charlie’s military records. Cuchulain has had enough and grabs the Warden, as he does so he is set upon by the Jadroxian Gladiator guards. Rather than feeling worried, Cuchulain is thrilled and asks Vance to go get Charlie, while he has some fun. The Warden calls down to one of the sub-levels and orders a double D alert. A frightened guard presses a button to turn the TV off, pointing out that Cuchulain has ordered the cartoons turned off. 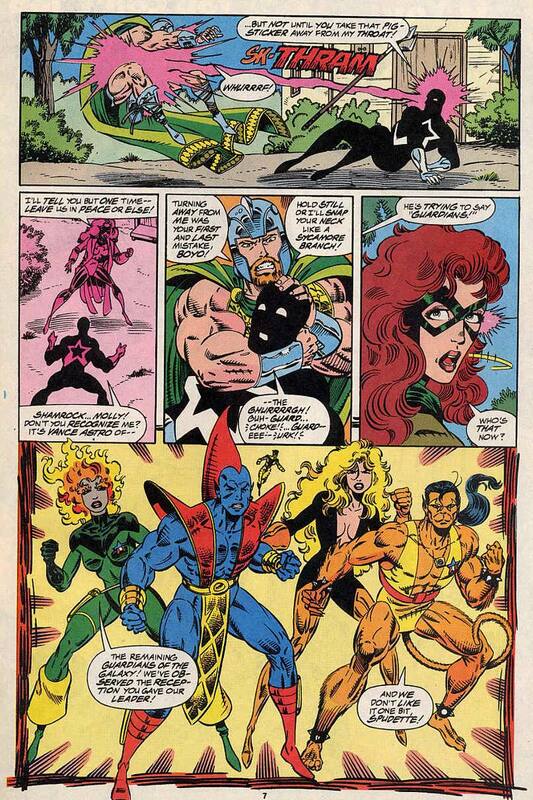 This enrages the person watching the cartoons and we have the first Guardians of the Galaxy appearance of Drax the Destroyer. The Charlie-27/Ripjak story finally steps into high gear, it’s been a slow build up, but it’s been worth it. The team is fracturing even more now, with several tensions bubbling away. It was fun to see everyone running out of bed to see what the problem is, Nikki in slippers, running is just hilarious to me. 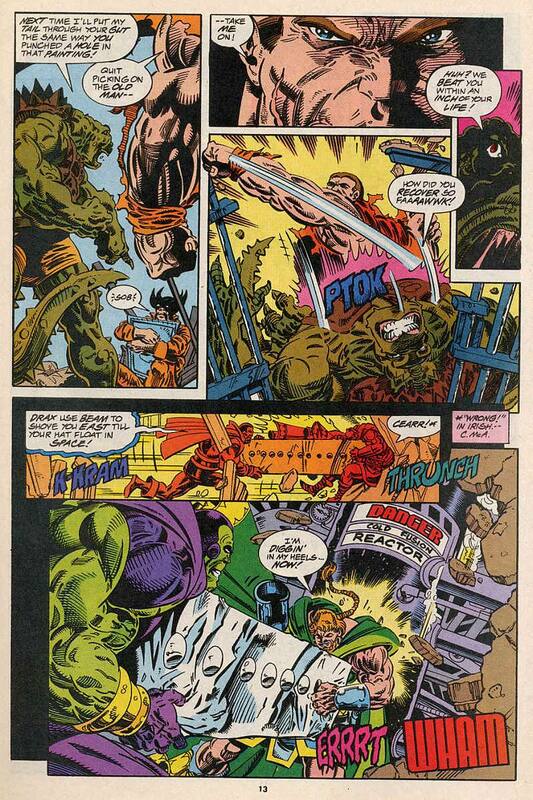 The scene were Krugarr washes his hands of Talon is a nice poignant moment, almost wasted in the way this issue flows, but it does put Talon firmly on this new beast-man path. The no women on Stockade seems oddly sexist for the future in space, but it does give Cuchulain reason to be on the prison planet. Diablo having seemingly lost his mind, makes a lot of sense, over a thousand years old and he wasn’t mr stable to begin with, but his helping of Charlie tells you that there’s something else going on in his head. 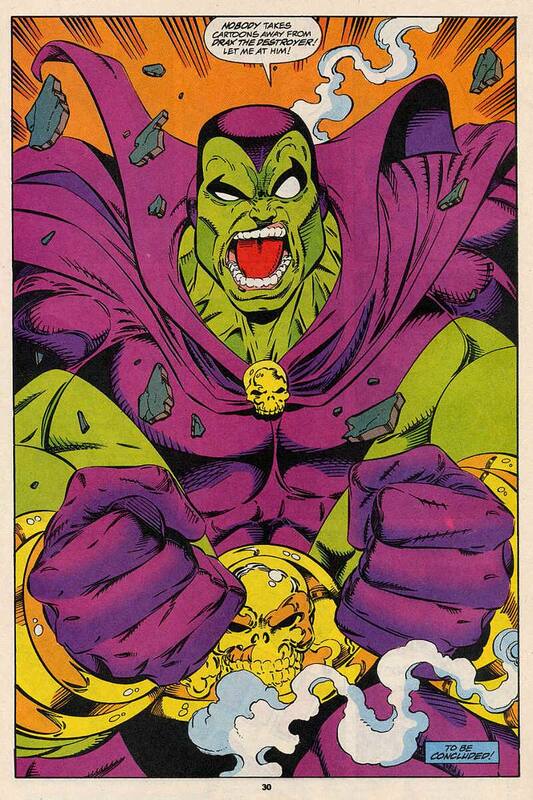 This is the first appearance in the Guardians of Drax the Destroyer, who has since become very famous in the relaunched Guardians of the Galaxy team. 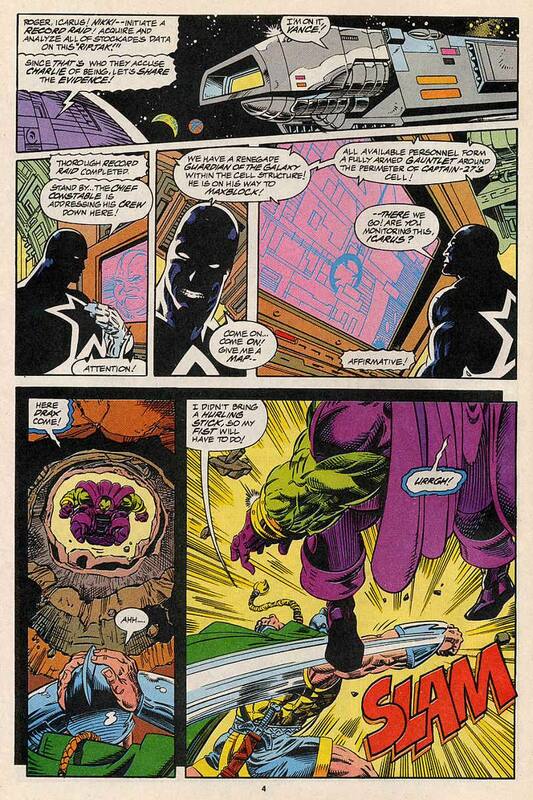 At this point in the main continuity, he had been resurrected by his daughter Moondragon and had come back damaged, most of his intelligence had been lost and he was quite child-like. This is the version we got here and the idea of him being a last resort weapon is kind of funny and leaves you with a great to be continued. NEXT TIME: It kicks off. 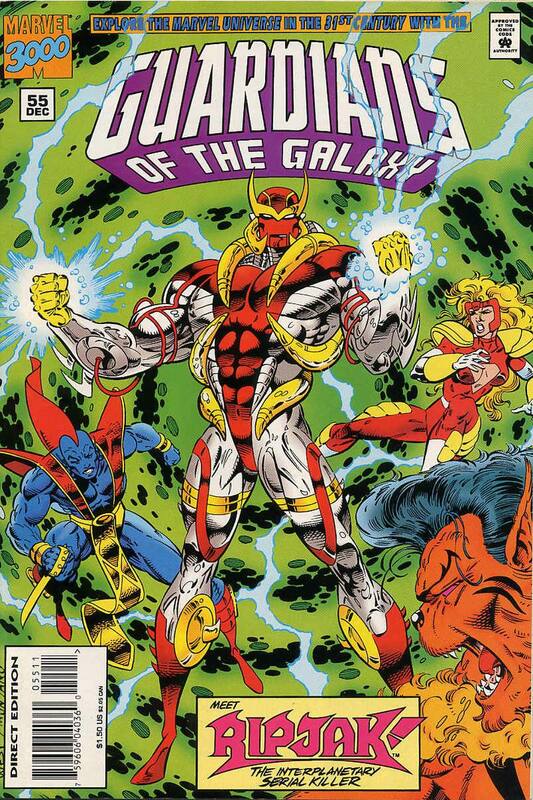 Guardians of the Galaxy 51 was cover dated August 1994 and was on sale June 1994, sharing the spinner racks with Archie Meets Punisher #1, Blaze #1, Lobo: The Chair #1, Vamps #1, Will to Power #1 and Worlds Collide #1. 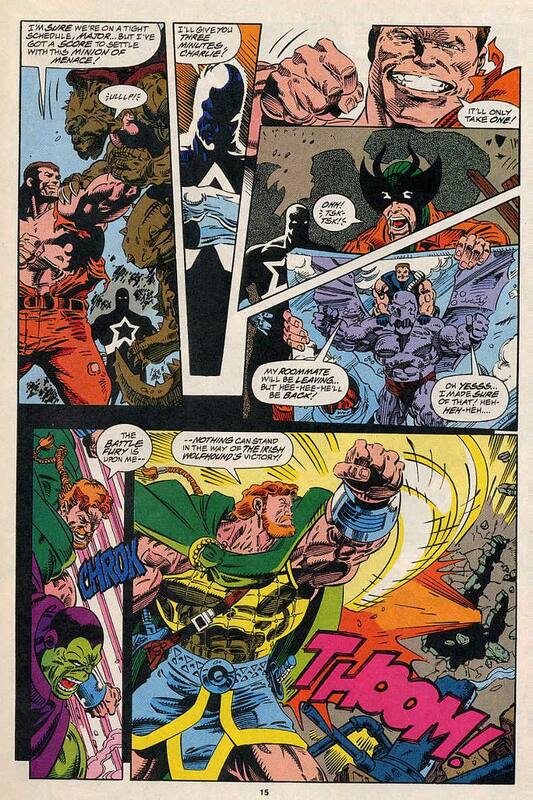 He who loses hope may then part with anything was written by Michael Gallagher, with art by Kevin West and Steve Montano and opens with Molly Fitzgerald, the 20th super-hero called Shamrock helping out in a town somewhere in Europe, trying to rebuild civilisation there. 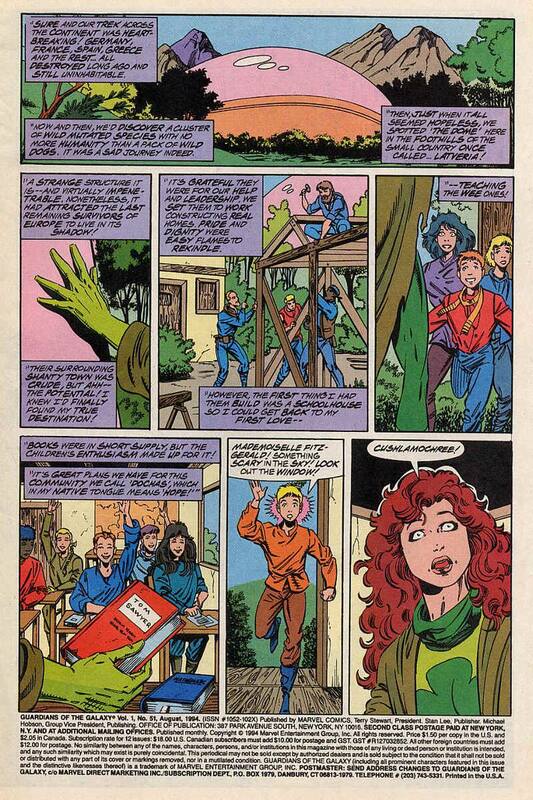 The people are startled to see a star ship appear over the town and call for Shamrock’s aid. There is a bit of a scuffle, until the rest of the Guardians arrive to defend Vance. Cuchulain recognises Talon, as he leaps at him and is glad to see them. It turns out that the Guardians are there to recruit Cuchulain for a mission, to find and rescue Charlie-27. 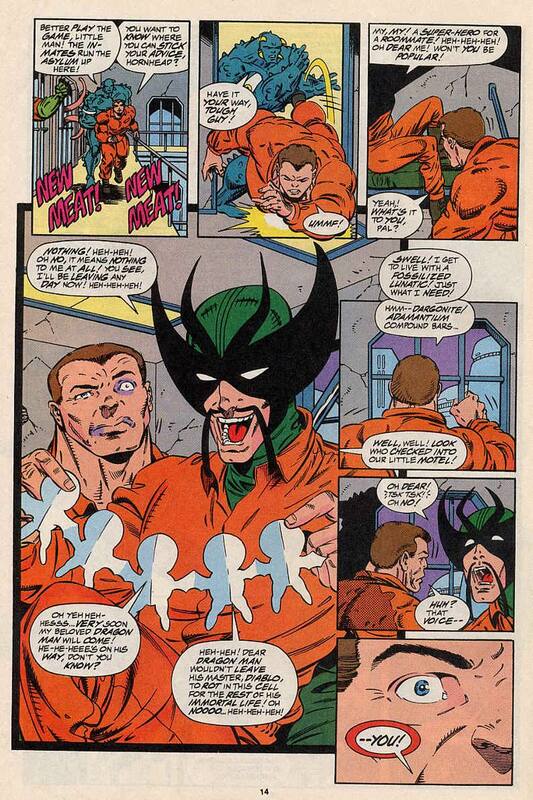 After being seperated from the rest of the team on Haven II (see Annual 4 http://wp.me/p4jGd8-v3 ) Charlie-27 has been taken by the constabulary to the interplanetary prison Stockade, mentioned in Galactic Guardians 4. Nikki is visibly upset by this news and the team vow to free him, but they need muscle hence their need to recruit the Irish Wolfhound. 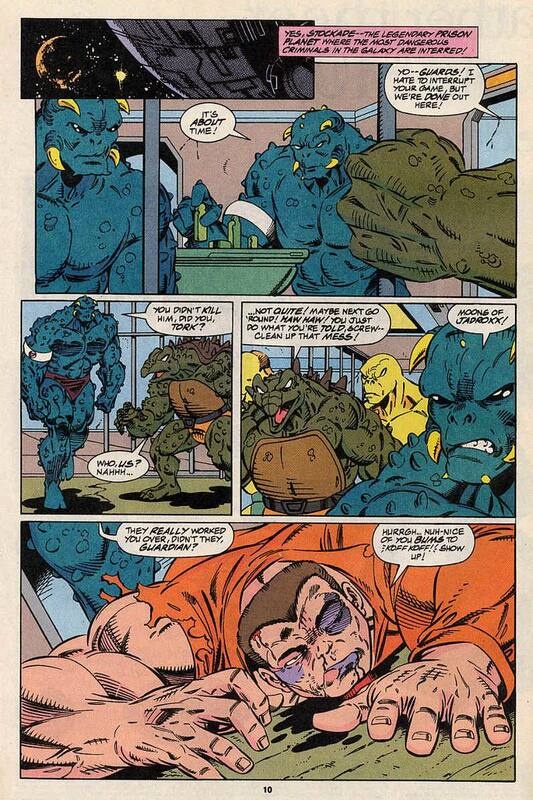 On Stockade, Charlie-27 is being tortured to get him get to confess to the crimes of RipJak. Since he is innocent, he refuses and he is sent back to maximum security. 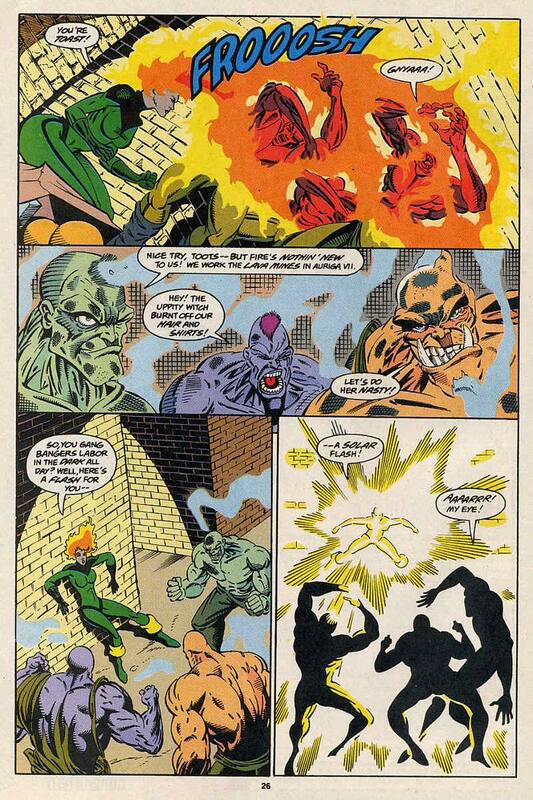 There he meets his cell-mate, the ancient Fantastic Four villain Diablo and the man running the cell-block is Tork, one of Korvac’s old minions, sent to Stockade by the Guardians. Culchulain says a heartfelt goodbye to Shamrock and is tele-ported to the Icarus, a shock to the system for a medieval warrior. 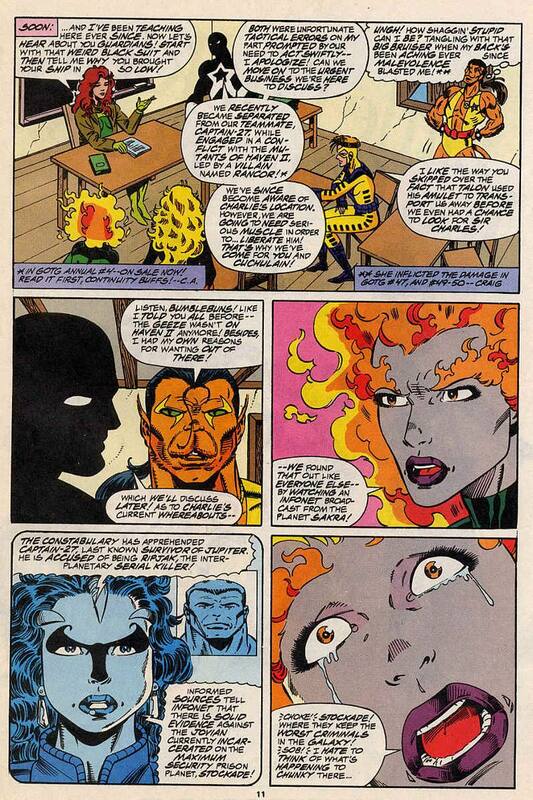 As Nikki, Aleta and Yellowjacket try to acclimate Cuchulain, Vance takes Talon aside to talk to him about his recent behaviour, the damage to his back and whatever happened between him and Rancor. 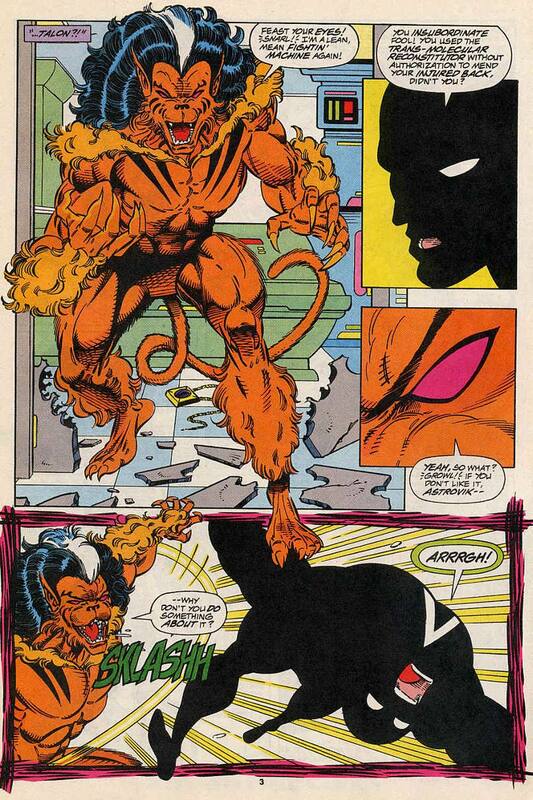 Talon becomes angry and walks away and when Vance tries to bring him back a fight breaks out. Before anything interesting can happen, the internal alarm goes off and it looks like Cuchulain is having more problems adjusting. 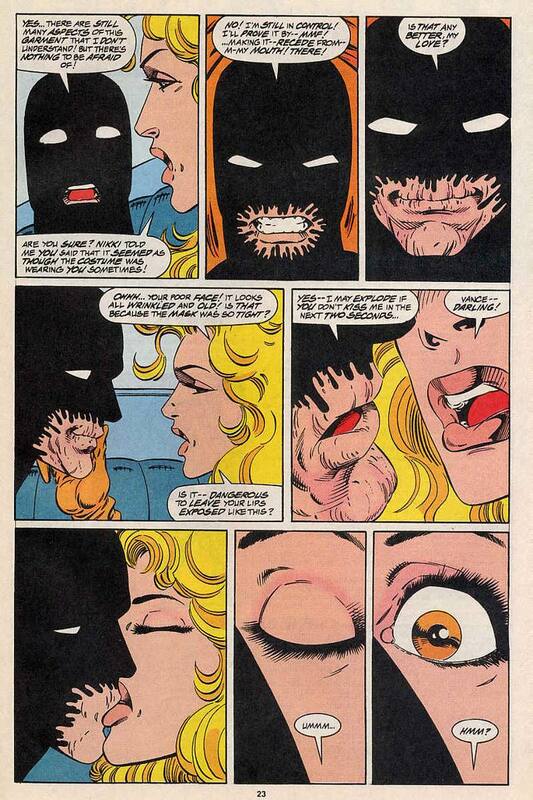 After the clean up, Vance and Aleta have some alone time and Aleta tries to kiss Vance, but the body suit he’s wearing reaches out to her and causes her to pull away in revulsion. 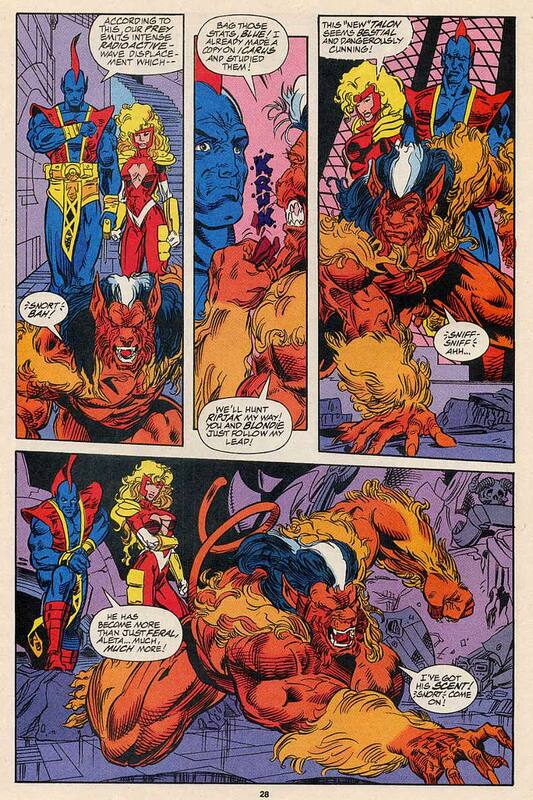 Once again, something comes between Vance and Aleta. 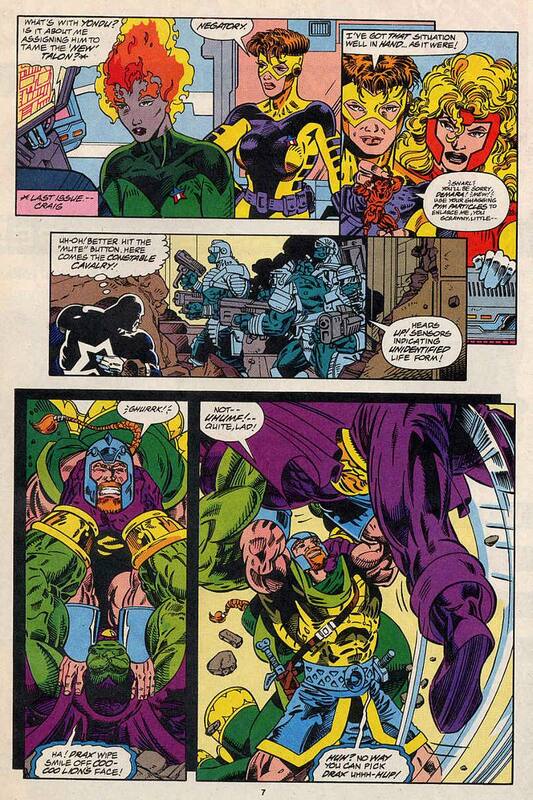 At the end of the issue Talon is trying to use the Trans-Molecular Reconstitutor to repair his back, remembering how well it helped Charlie after his battle with the Badoon. He needs someone to operate it, but knows that anyone he asks will bring Vance in on it. Then as luck would have it, Cuchulain walks in, curious about some of the technology and Talon convinces him to turn it on, telling him it’s a tanning bed for furry creatures. Although reluctant, Cuchulain does as asked and Talon emerges from the machine more cat-like than ever. 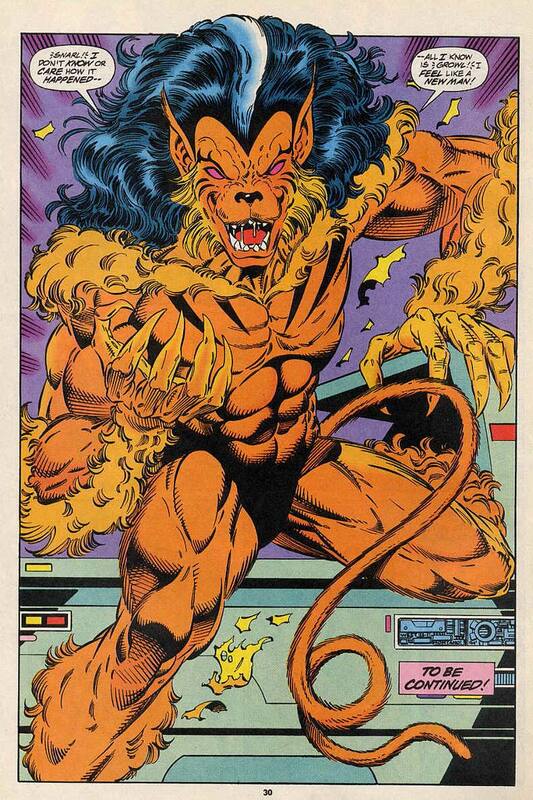 He’s now less of a jovial mystic and more of a feral lion-man. This is where the issue ends, but there’s a lot more to come. Notes: This is a bit of a padded story, used mainly to move the sub-plots along and move the Ripjak story to the main arc. Charlie-27 in prison is an interesting idea, which the issue tries to make the best of and Tork being a head of a prison gang makes a lot of sense. Cuchulain isn’t the most compelling character, but it was an excuse to use him again and he gets a lot more to do with the story when they get to Stockade. 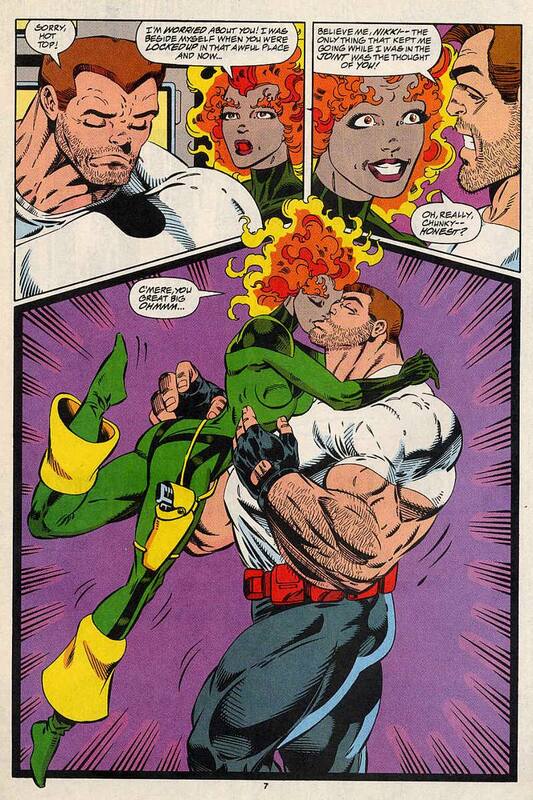 More forbidden love stuff with Vance and Aleta (Yawn) I’m at the point now where I’m no longer rooting for them. 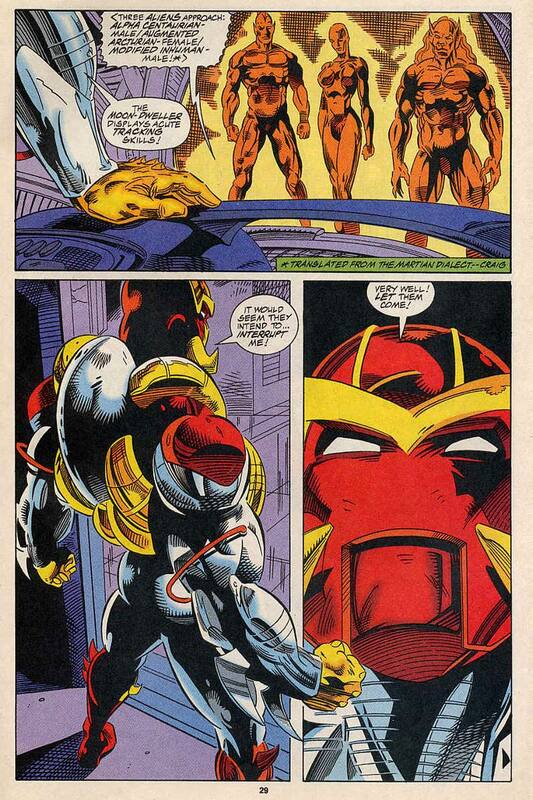 This marks the start of the internal struggle between Talon and Vance over Vance’s leadership of the team. 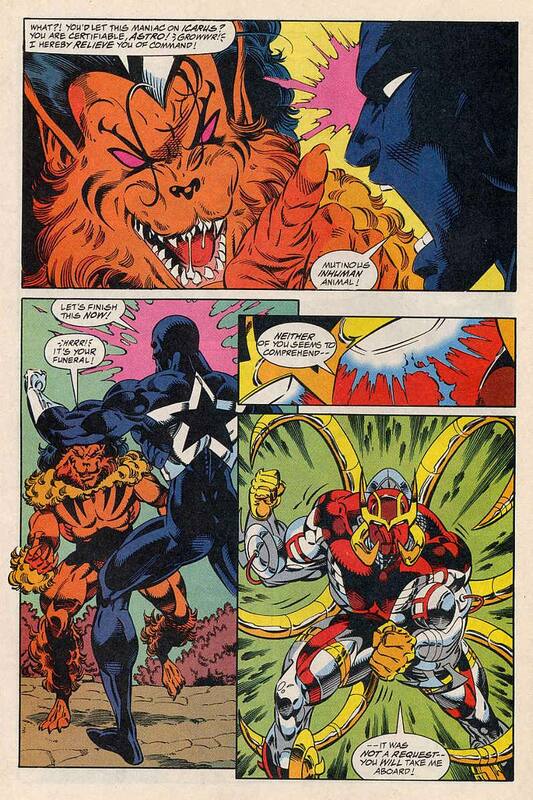 The last year of the Guardians makes quite a lot of this idea and the team is starting to fracture. I like this issue, but it’s an issue after a good one and an issue before the next good one, so I’m more looking forward to 52 and onwards. Next time: Action. Mayhem. Broken stuff.